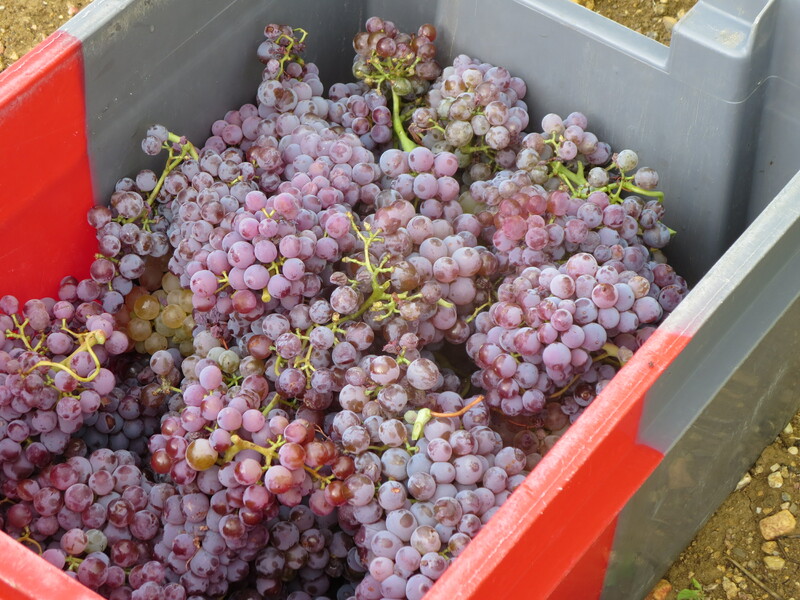 The harvest (vendange) began on Friday August 21st with a small parcel of Muscat grapes as described here. 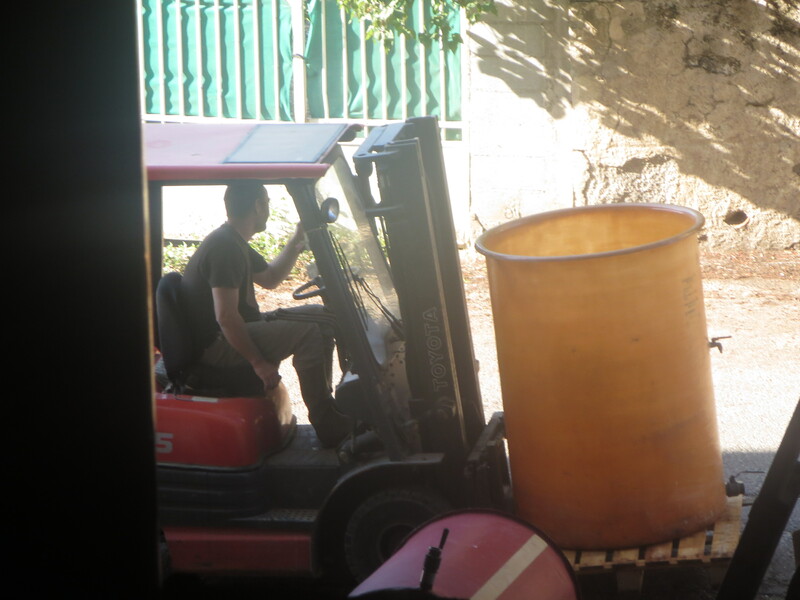 The next few days saw further preparations for the main harvest, for example clearing space in the barrels of the solera system for this year’s grapes. I shall write more about the solera later in the year. So, it was Thursday 27th which was the start of the real vendanges with parcels of white and Syrah grapes collected from La Garrigue. This day was described here. 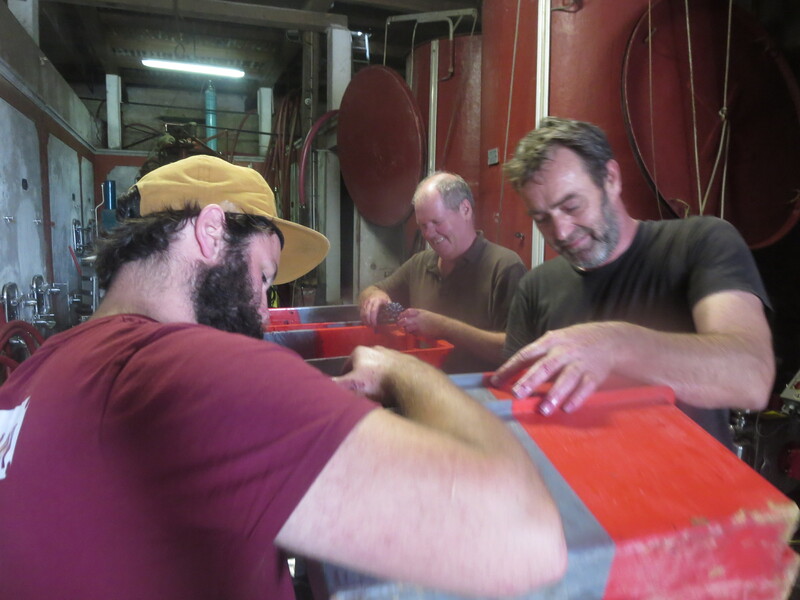 Friday 28th saw more Syrah being harvested, this time the Syrah of Metaierie usually referred to as Sainte Suzanne by Jeff. This is the vineyard of Vin Des Amis though options are always open. 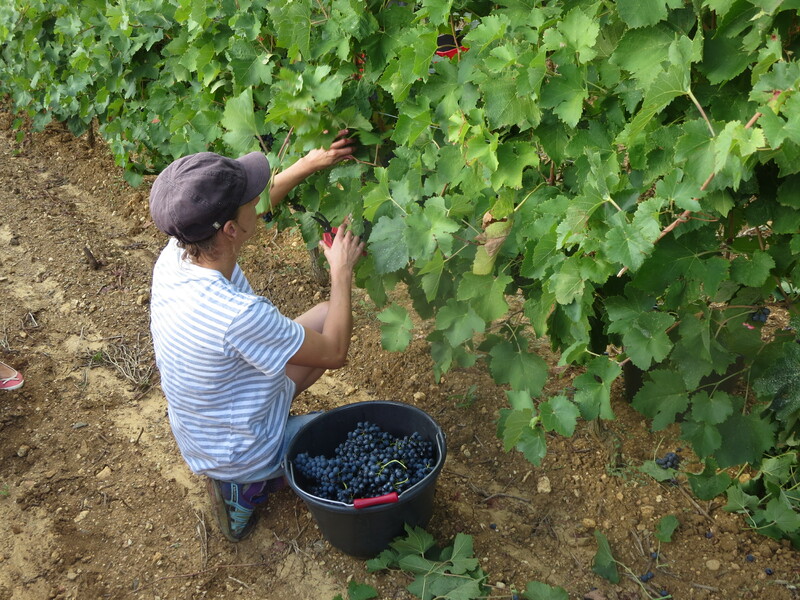 The pickers, led by Carole and Julien, worked through a cloudy morning to collect some high quality bunches. Michel transported the cagettes back to the cellar as quickly as possible. 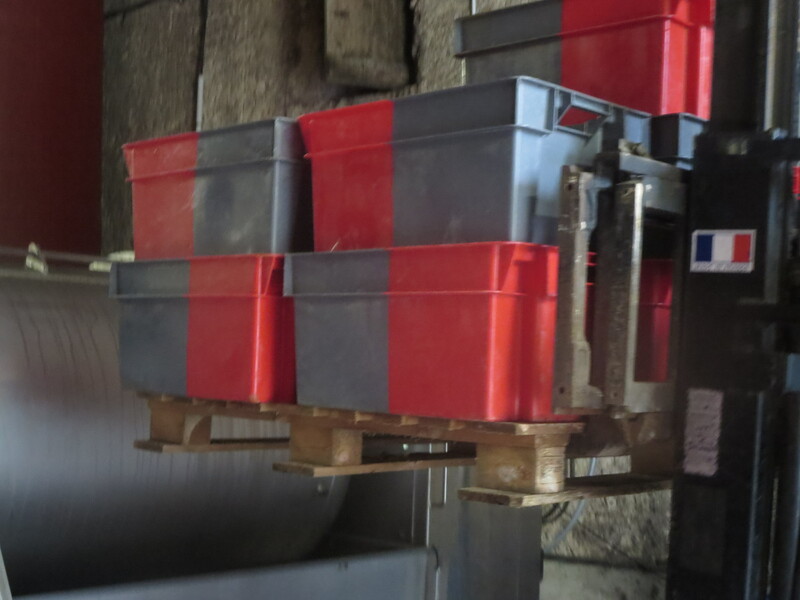 The cagettes are about two thirds filled so as not to overload the grapes in there which might damage them. No, these cagettes are not full! Upon arrival at the cave the cagettes are quickly taken for triage, sorting through the grapes to select only the best quality. Foreign objects such as snails and spiders are removed as are unripe grapes, any damaged or rotten grapes. 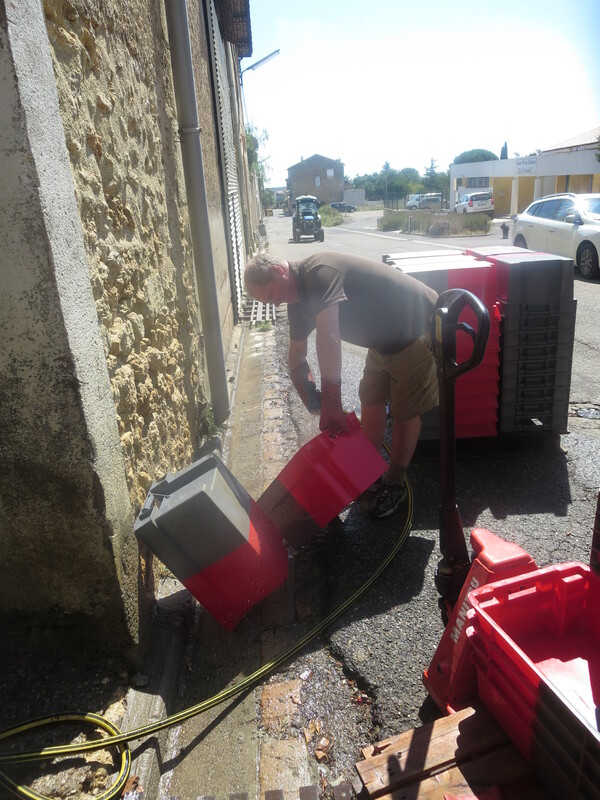 It is important that only the best goes into the wines to keep them fresh and at the high quality we expect from Mas Coutelou. Two people sift through the cagette, removing any inferior grapes for further sorting by a third person. Jeff, Cameron and I took these roles on Friday. It is hard work, on your feet all day and lifting, carrying and sorting requires physical effort and also full concentration. There is, happily, also time to chat and laugh. Cameron is from Melbourne, Australia and has been living and working in London as a sommelier for four years. 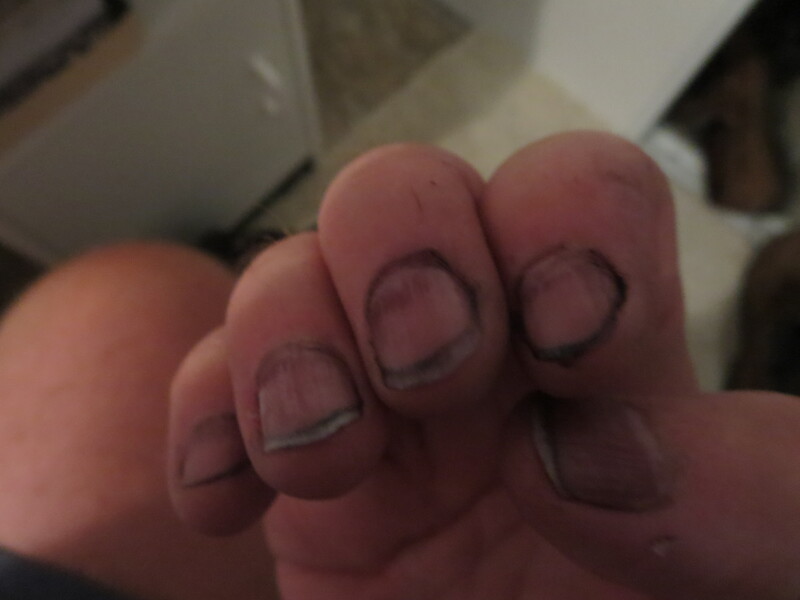 He decided to learn more about the winemaking process and to “get his hands dirty”. He is already proving his worth and is a great addition to the team. Meanwhile, the grapes which had gone to vat (cuve) have to be taken care of. 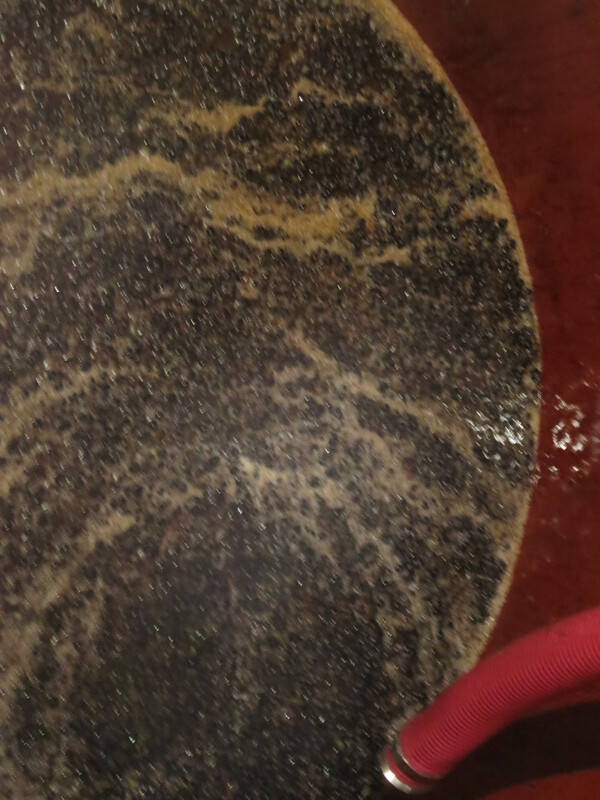 Fermentation has started and the wine is already producing material which needs to be removed to keep the wines clean. 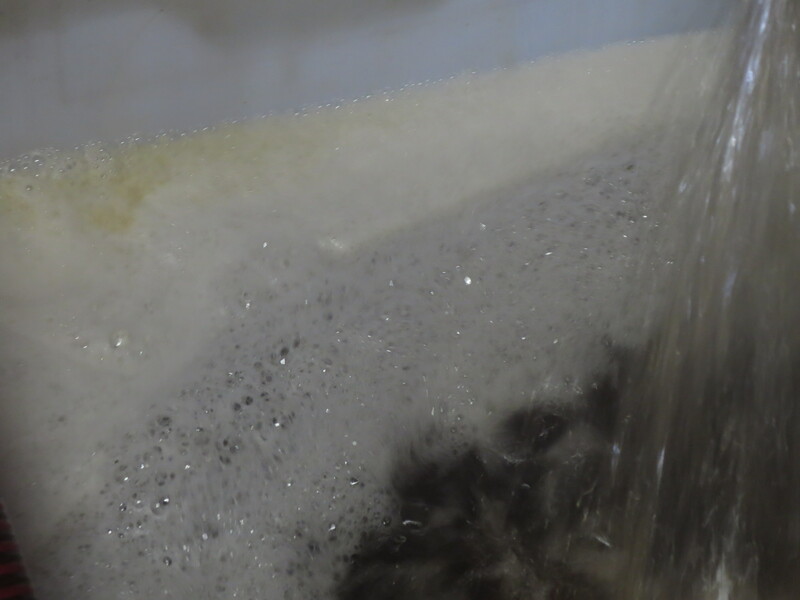 They are, therefore, pumped out of their original cuve into another to allow the waste to be cleaned away and the fresh, juice ready to settle for its longer journey of fermentation. And at the end of the day the cleaning work is intense. Everything is cleaned throughout the day but at its end another full clean takes place. 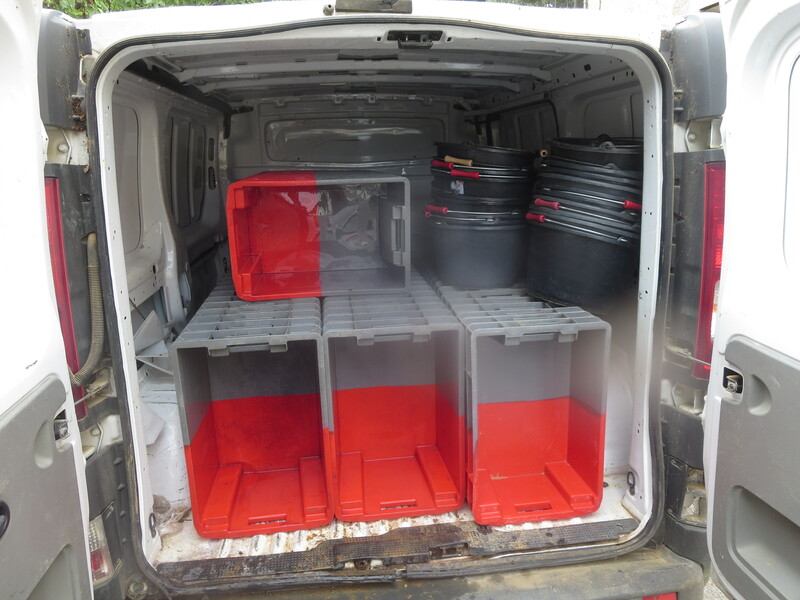 This removes the risk of contamination from dirt or damaged fruit which would ruin the wine. It is laborious but necessary. What else needs cleaning? Proof that I did work! 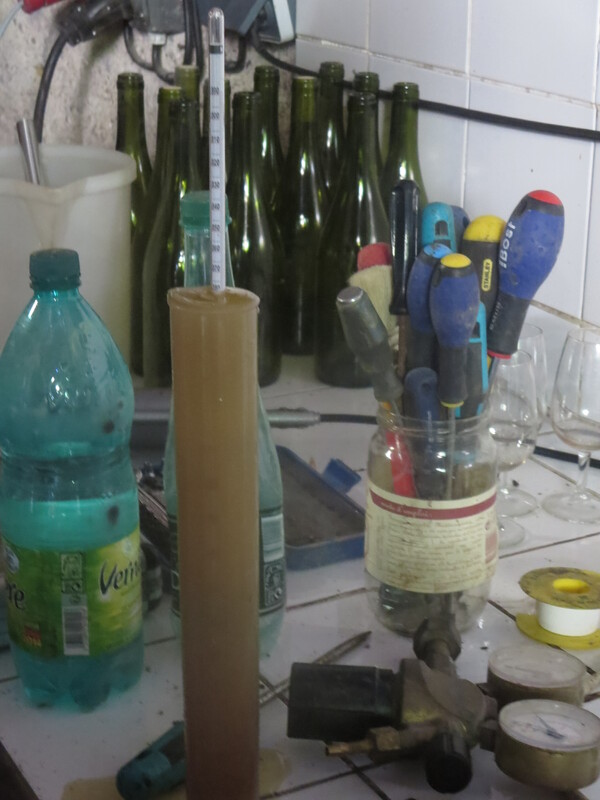 Analysis of the Syrah showed that the alcohol level was around 12.7% with medium levels of acidity. Later picking would have added more sugar and more potential alcohol but would have lowered levels of acidity. The skins are essential to the quality of the wine as they contain the colour, tannin and much of the flavour of the wine. These were in excellent condition according to the analysis, good news. 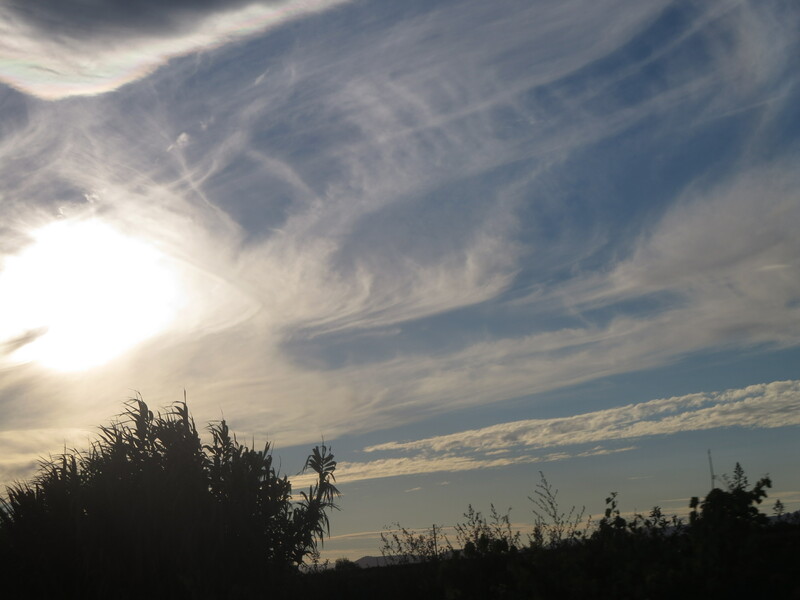 There have already been some concerns expressed by winemakers and analysts that the heat of 2015 might affect the quality of wines around France especially regarding acidity. 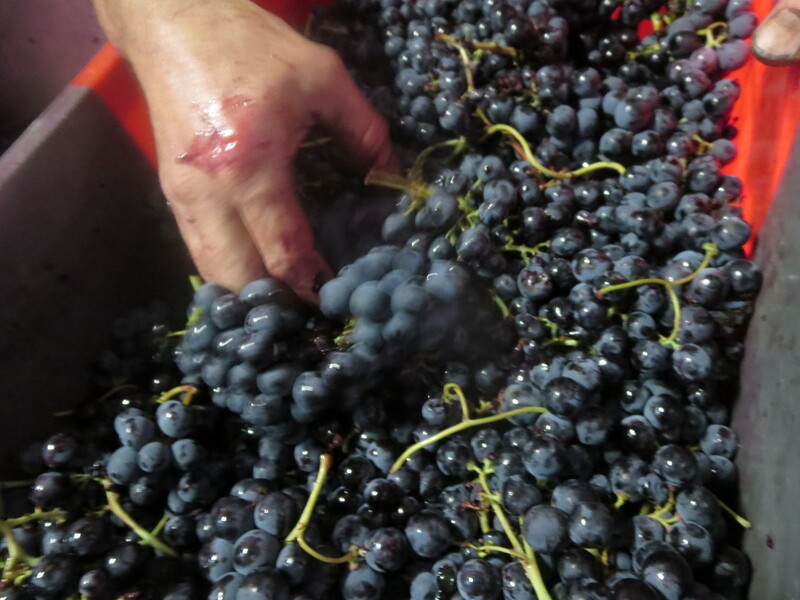 The decision to harvest the Syrah was therefore the right one, fresh, cleansing acidity is a hallmark of Jeff’s wines. 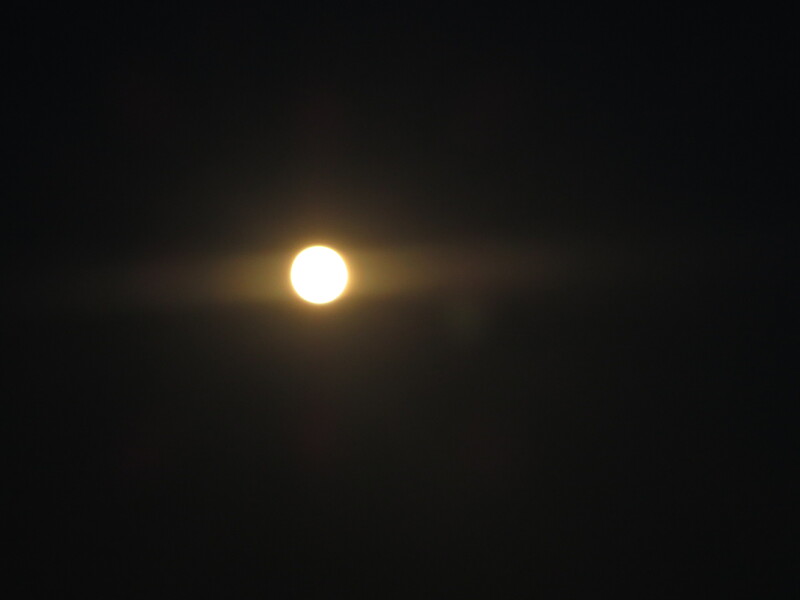 Many winemakers have been waiting to start harvest as, on August 30th, the moon is at a perigee, the time when it is closest to Earth in its orbit. As it begins to wane and move away from Earth many winemakers will start their harvest. 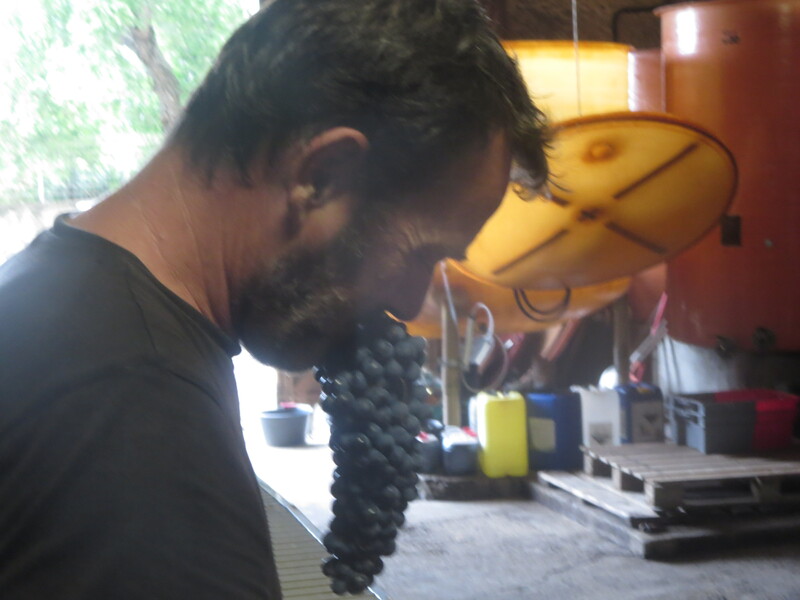 Jeff has chosen to put the quality of the grapes first rather than principles about biodynamics. 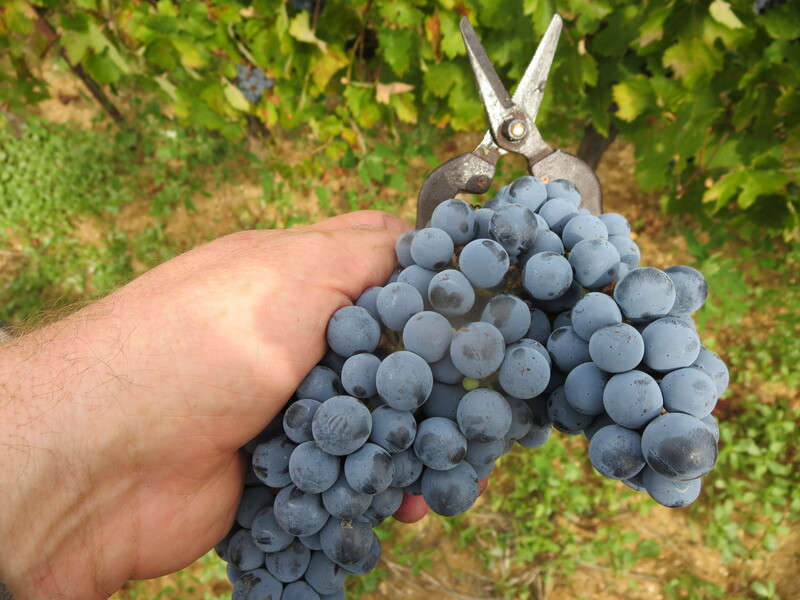 Saturday 29th was a work day for the cellar and the pickers and saw the harvesting of Cinsault grapes from my favourite vineyard, Rome. 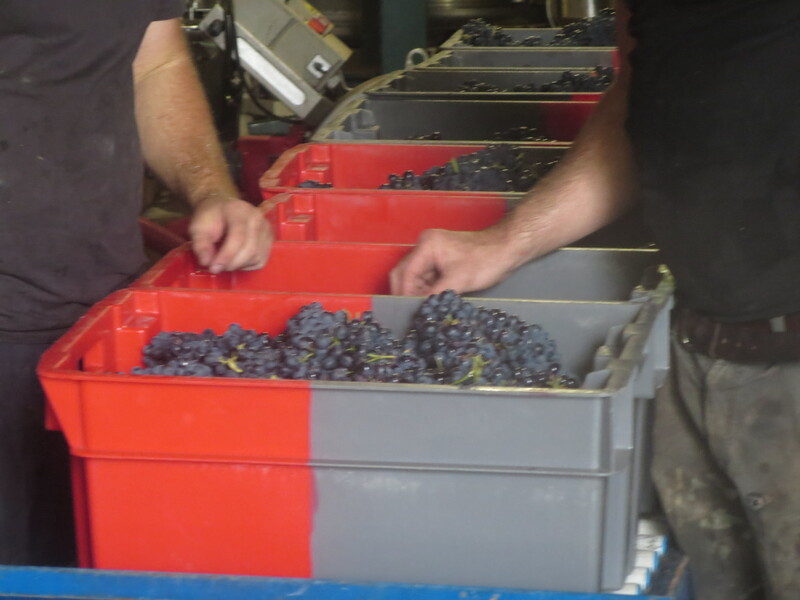 The grapes were big and juicy though some were uneven and needed more careful sorting. 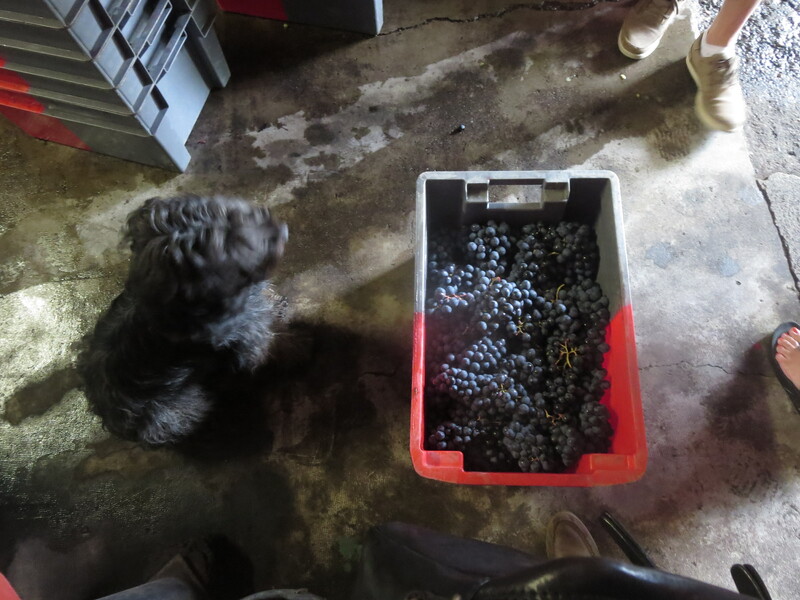 Clearly these were precious grapes as Icare was guarding and watching over them assiduously. 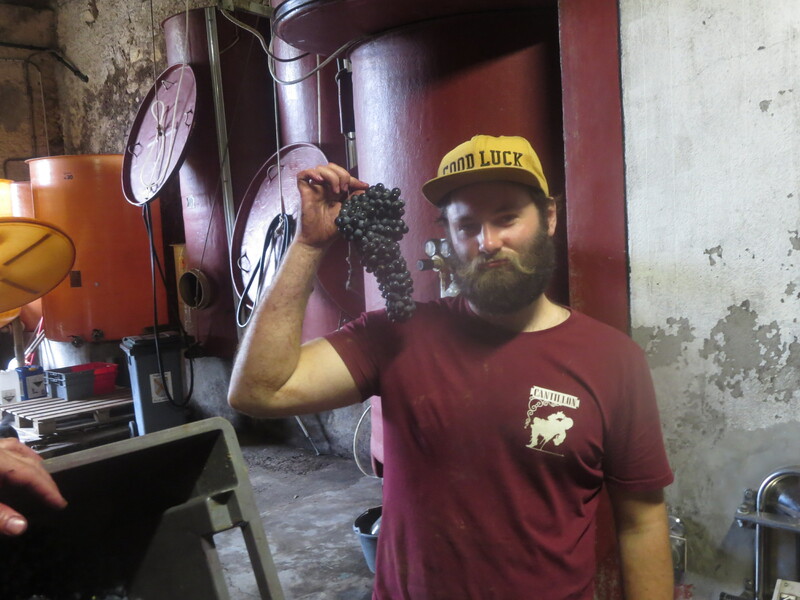 The harvest was not as big as many years and so the pickers moved onto Sainte Suzanne again for more Syrah grapes whilst yesterday’s grapes have begun to ferment already. Categories: Vignerons, Vines, Wines | Tags: acidity, Cinsault, fermentation, Metaierie, perigee, Rome, Sainte Suzanne, Syrah, triage, Vendanges, Vin Des Amis | Permalink. 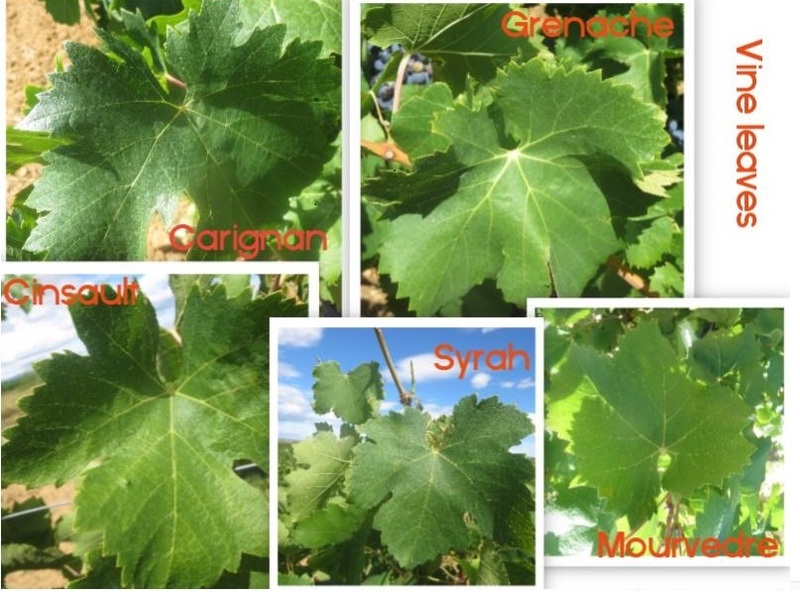 In my last post I described the leaves and some other features of the five main red grape varieties to be found in the Languedoc Roussillon region. This is all part of my attempt to learn how to identify different vines more easily. So what about other varieties which are to be found at Mas Coutelou? 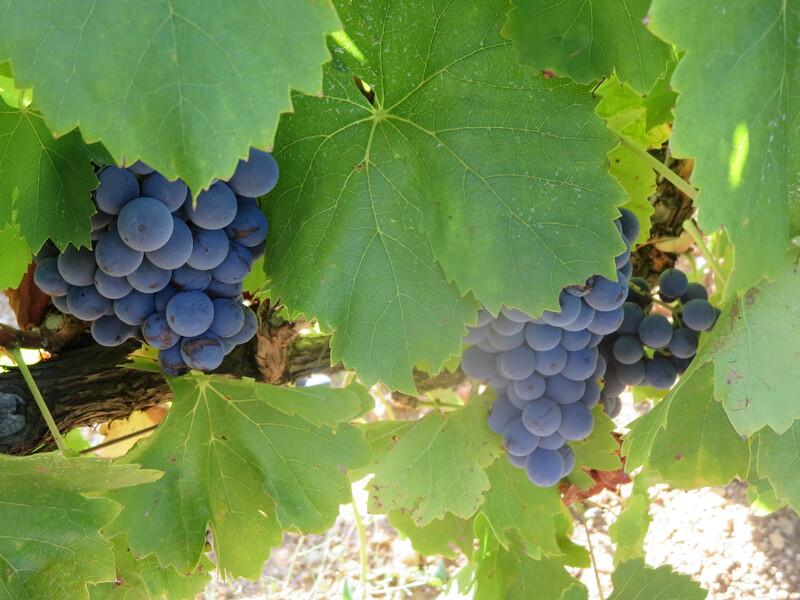 Usually associated with Bordeaux and other regions of France there is Cabernet to be found in the Languedoc. Much was planted in the 1980s and 90s as Cabernet Sauvignon, Merlot and Chardonnay were the big sellers on world markets and vignerons here tried to make money from that market. It is easy to deride this move but vignerons have to make a living and if they can sell grapes then who is to blame them? 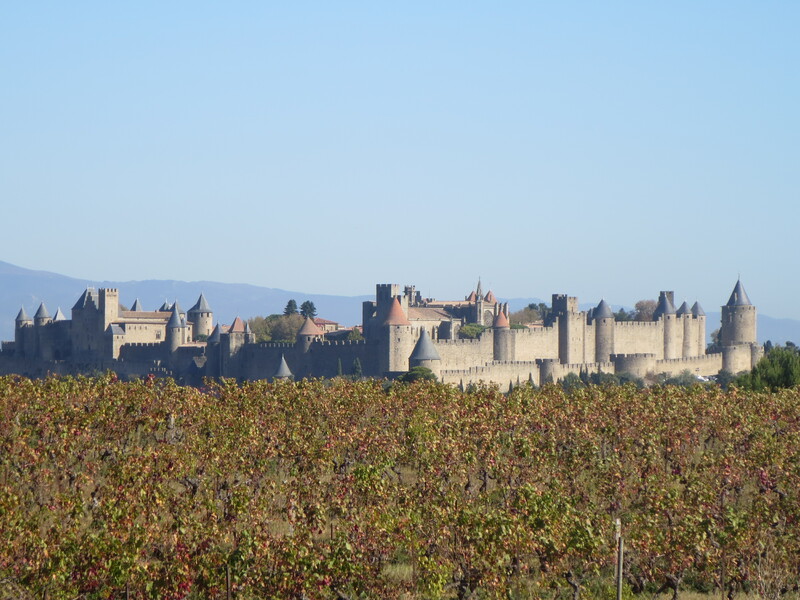 Besides the domaine which first brought the Languedoc to the world stage, Mas de Daumas Gassac, uses these international varieties as part of their blends. I have to admit that it is not my favourite wine, certainly not the domaine’s red, but it has made an impact. Anyway, to ampelography. 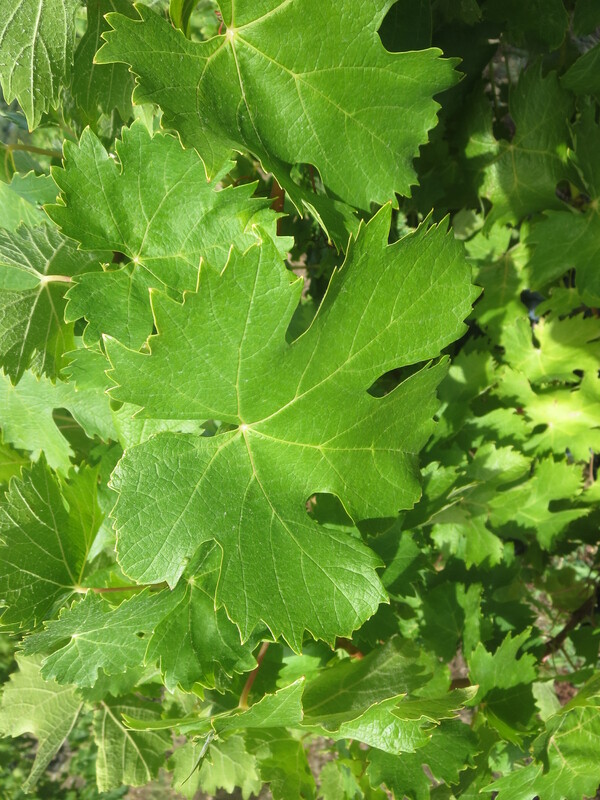 I love Cabernet Sauvignon leaves, they are so easy to identify with their two eyes in the leaf which makes them look like a startled face. A rich green colour the leaves have more lobes than most and the lower lobes overlap to cover the base of the pétiole sinus (the space where the stalk meets the leaf) giving the mouth like appearance you can see in the photo above. Generous teeth around the lobes are noticeable but it is the two spaces in the leaf which makes this easy for me to recognise. The grapes are small with hard skins and form small clusters too. Poor old Merlot seems to be currently out of fashion. Seemingly everybody’s favourite in the 1990s I regularly hear people now say how it is their least favourite variety, and I confess it is one of my least popular grapes. 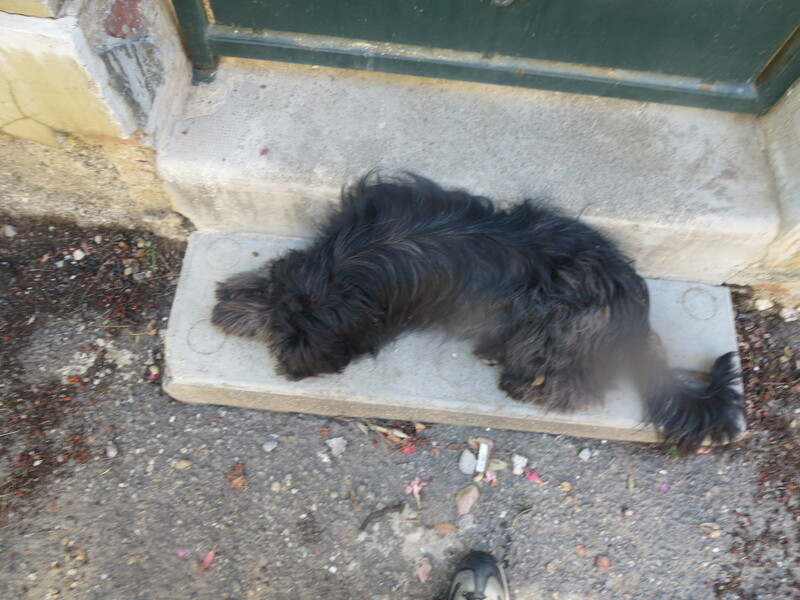 It is capable of great things on the right bank of Bordeaux and elsewhere but it is little seen here in the Languedoc. Jeff has one parcel, Colombié, entirely planted with Merlot which is mainly used for restaurant blends and bag in box wine. The leaf in the photo shows that these are rich green in colour with 5 or 7 lobes. The sinus around the stalk is open and U shaped with a large white spot where the veins come together just above this sinus. In this photo the veins are quite green as they spread out. Medium sized teeth surround the leaves. Grapes are medium sized and so are the bunches so few clues there. This local grape was once widely planted in the Languedoc but was grubbed up in recent years as its reputation spread as wines with little flavour. This was unfair as it was often grown to give big yields and so flavours were diluted but there are many who still scorn it. 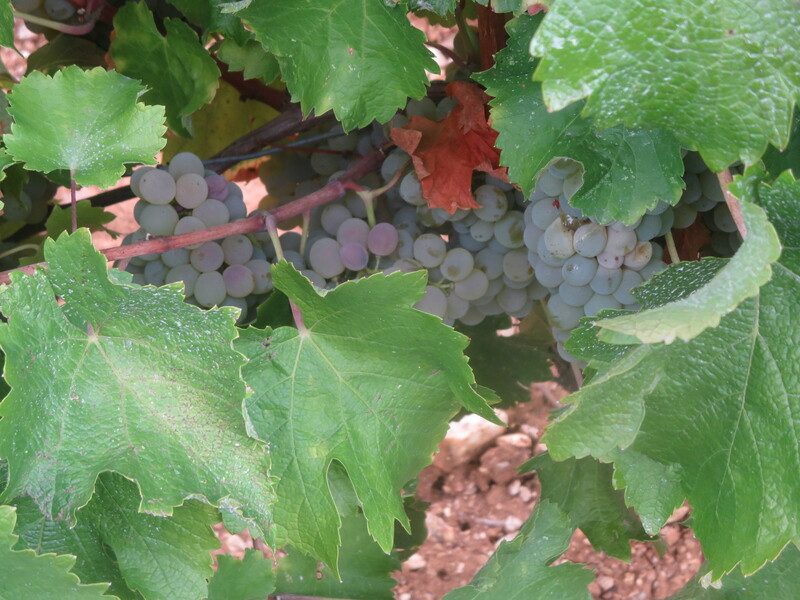 Nevertheless, with low yields it can make good wines and there is a recent trend to replanting Aramon. The leaves are almost trefoil in character with big veins which stand out against the dark green colour. The teeth are quite large in the lower lobes and taper gently to the top. The pétiolar sinus is big and V shaped. It is the grapes which make Aramon identifiable. They are big in size and form large cylindrical clusters. This reinforces the reputation as a big cropper of light red wines, one of its synonyms is Pisse – Vin which needs no translation. However, this is unfair and Aramon is starting to make some interesting wines again. Less than 30% of wine produced in Languedoc Roussillon is white, I was actually surprised at how high that figure is. The last few years has seen Picpoul De Pinet become very trendy around the world, reaching prices over £30 in some UK restaurants for wine which costs around 5-6€ around here. Improvements in vinification and the use of temperature controls means that the quality of white wine being made here is improving and there are plenty of excellent examples. 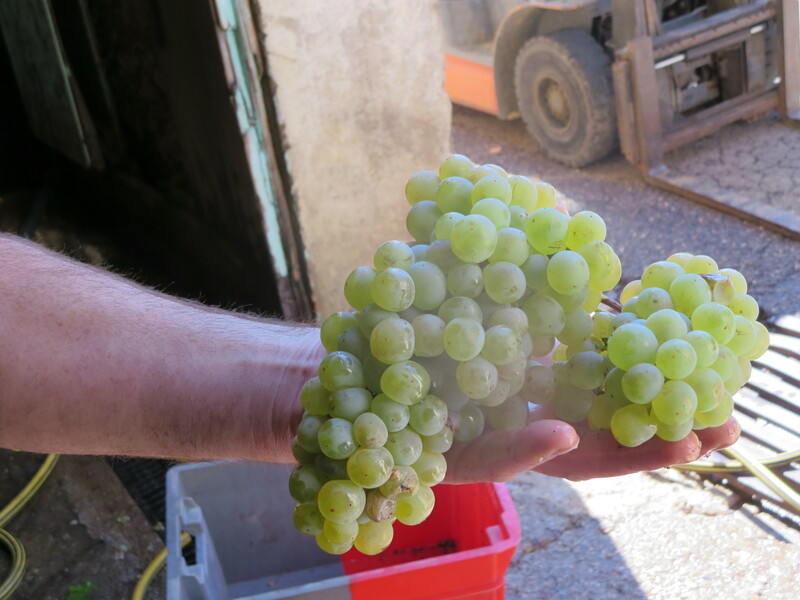 Jeff produces a few cuvées of white wine but many of the white grapes are complanted, mixed together in the vineyard, to add complexity to the blend and an expression of terroir. In terms of identifying these varieties the challenge is, therefore, more complex, as they are mixed up I tend to be too! Therefore, I have only included the main white varieties of the domaine here, there are many, many others! 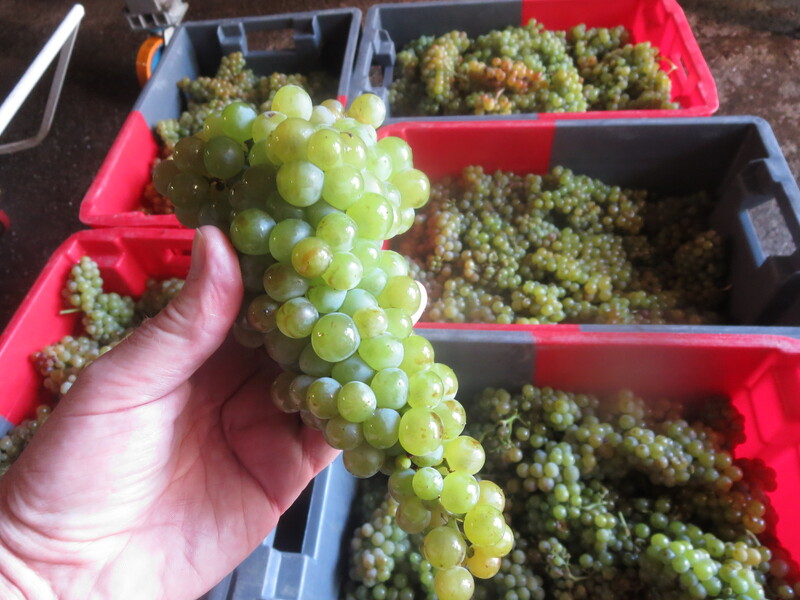 There are actually many different varieties of Muscat just to make identification even more difficult, e.g. Muscat A Petits Grains, Muscat d’Alexandrie and there’s even a Muscat Noir just to completely baffle me. Muscat is usually used to make sweet wines such as Muscat De Rivesaltes, Muscat De Frontignan and Muscat De St. Jean De Minervois. 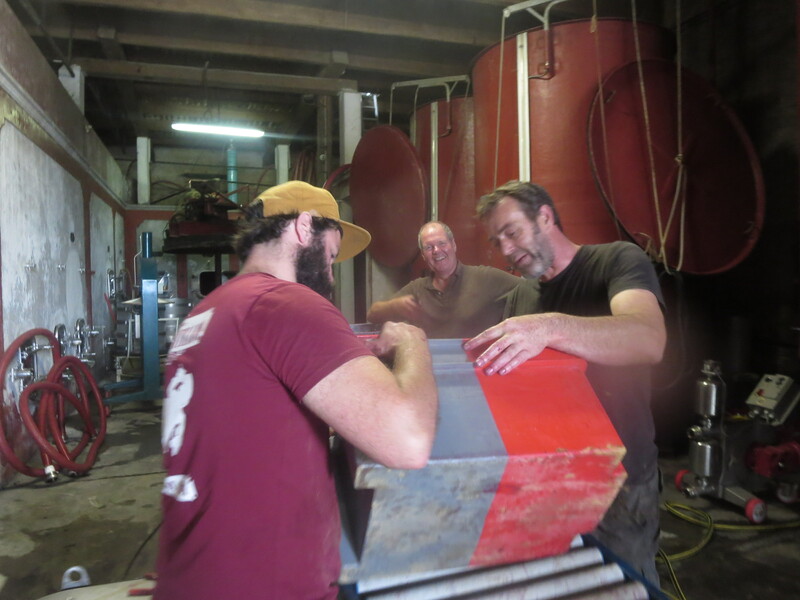 Jeff uses it in dry blends, is considering using it for a pétillant wine this year and also uses it in his sensational solera system to make rich, sweet and dry old Muscats. 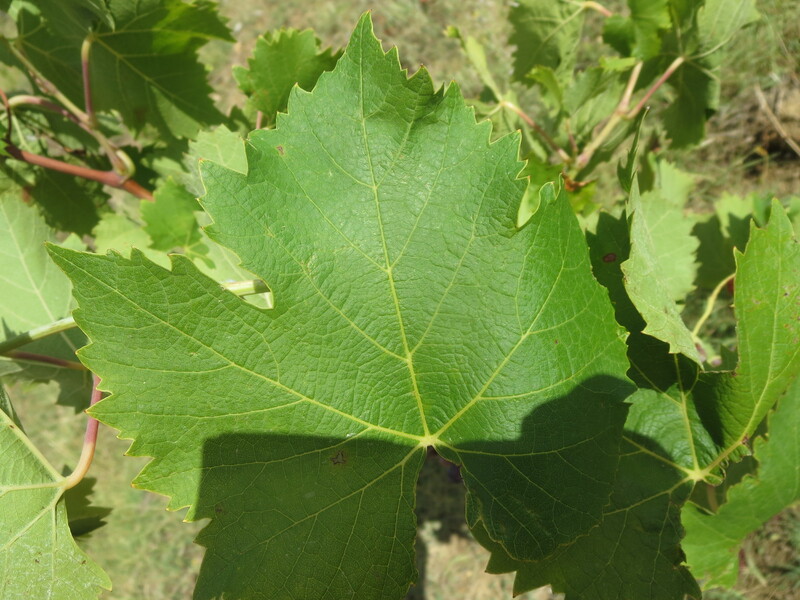 Muscat has quite dark green leaves and can be in 5 lobes though both the photos above show just 3, almost like a maple leaf. There are some big teeth around the leaf edge. The leaf is also relatively long compared to the width at the base and the sinus around the stalk is V shaped. The other distinctive feature is the crinkly, dimpled appearance between the veins. 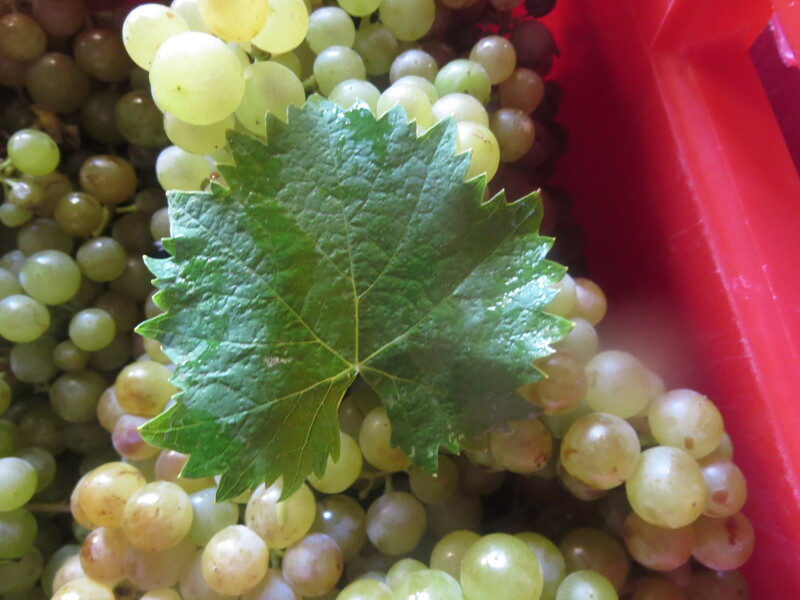 The grapes are actually fairly medium in size (despite the Petits Grains name) but form small clusters. The grapes are distinctive in colour as they become golden and bronzed in the sunshine with freckles too! Muscat grapes, admittedly more green than golden. These were picked early for dry wine. Not a variety much found in the Languedoc as it tends to prefer slow ripening and cooler climates. In Mas Coutelou it is used for blending with other white grapes to add a little zest and bite to the mix, picked early to keep that freshness as you can read here. Quite round in shape with 5 lobes and teeth which are sizeable but more round than angular. The veins stand out as they are not coloured, reaching down to the stalk sinus which is often closed or barely open. One distinguishing feature which is observable in the photo is that the leaf tends to curl a little at the edge, note how one lobe is curling under the other on the right of the photo. Small bunches of oblong but small grapes. There are many other white varieties which I could add but these suffice for my needs. 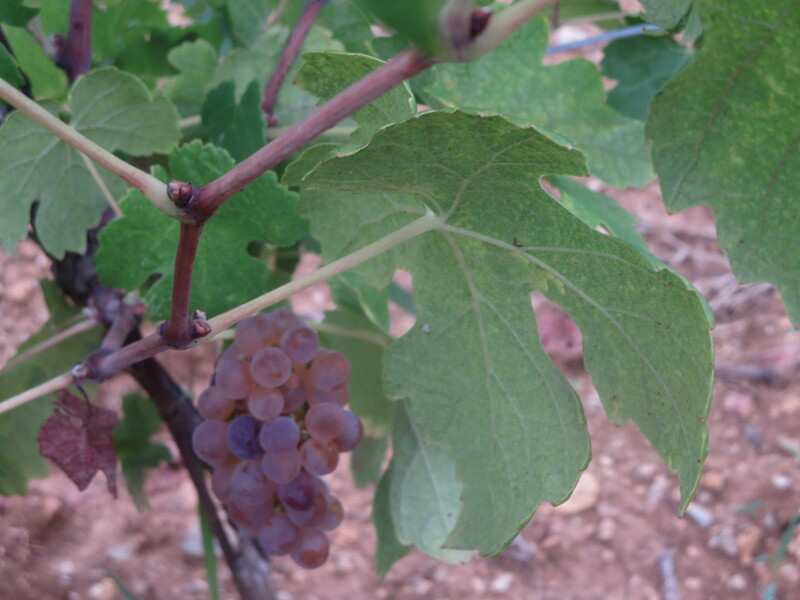 Carignan Blanc and Grenache Gris and Blanc are related to their black grape cousins and have similar appearances. Maccabeu, Picpoul etc are for another day but I think that is enough studying for the moment! There is a very pleasing trend in the Languedoc Roussillon towards replanting old varieties of vines. 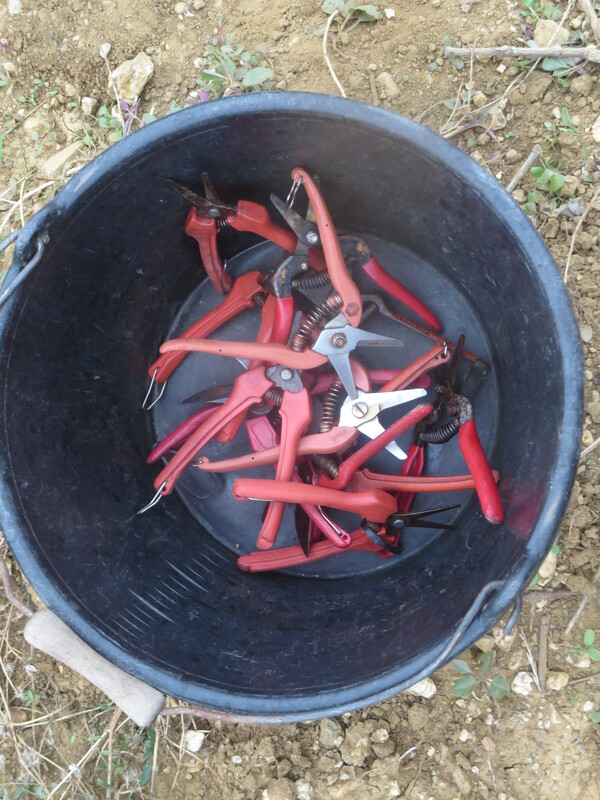 Terret, Ribeyrenc, Piquepoul Noir, for example were all planted at Mas Coutelou in March. And there remains the very rare Castets, brought in from Chateau Simone in Provence to be only the second vineyard to have this variety. So ampelograhy is an ongoing lesson for me, if you want to find out more these websites are worth a visit. Categories: Vines | Tags: Aramon, Cabernet Sauvignon, Carignan Blanc, Castets, Merlot, Muscat, Sauvignon Blanc | Permalink. Friday was a warm up, today (August 27th) was the real beginning. 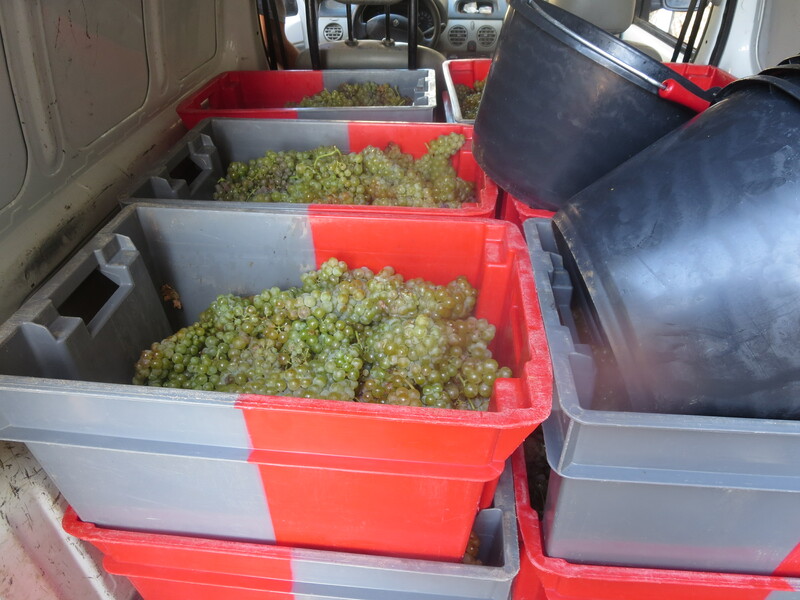 White grapes, mainly Sauvignon Blanc, and Syrah from La Garrigue vineyard were picked and pressed. Back to the cellar, straight into the press. 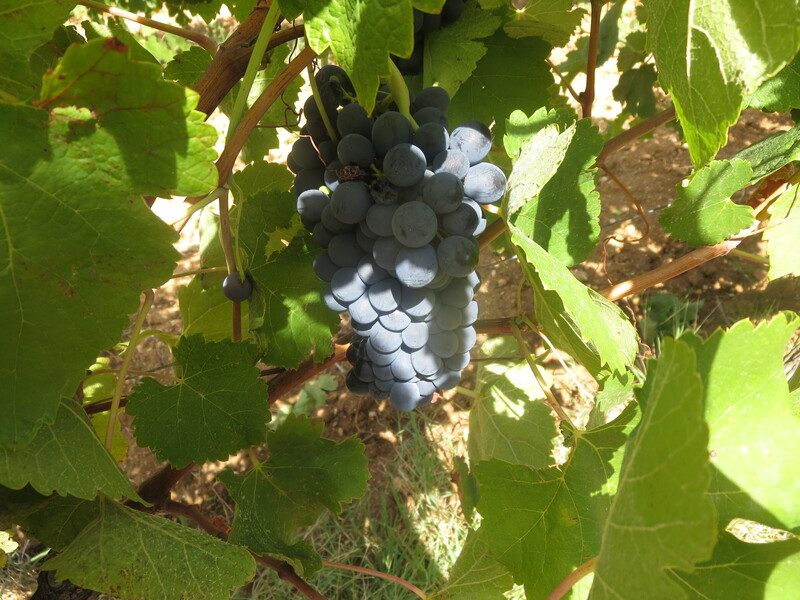 The Syrah looks especially good this year with a good balance of acidity and sugars. Some were ready and so in they came today. Great quality, 2015 is looking good, let’s hope the next month confirms it. 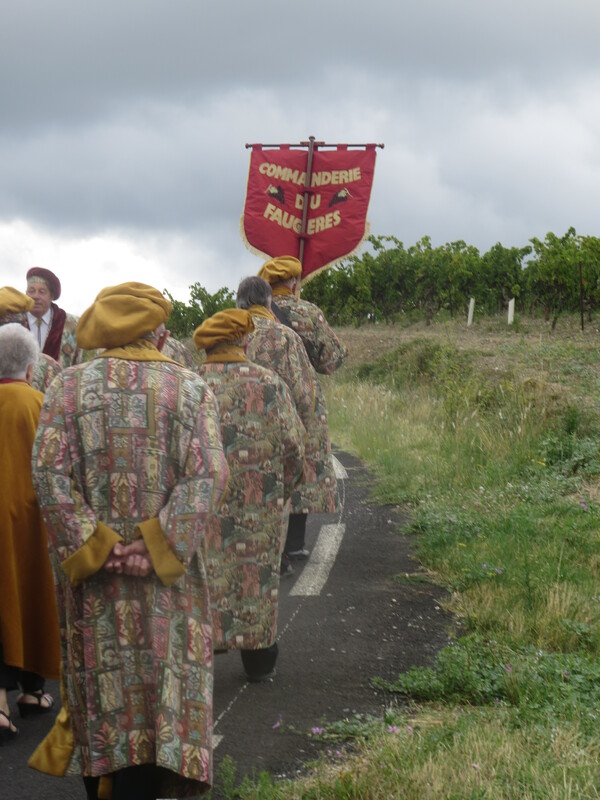 Coincidentally it was the official celebrations for the start of harvest in the Faugères appellation this evening with a ceremonial cutting of the first grapes. Good fun, especially getting to taste the wines of Clos Fantine again. Categories: Vignerons, Vines | Tags: Clos Fantine, Faugeres, Sauvignon Blanc, Vendanges | Permalink. When you live in the Languedoc you are surrounded by vines. 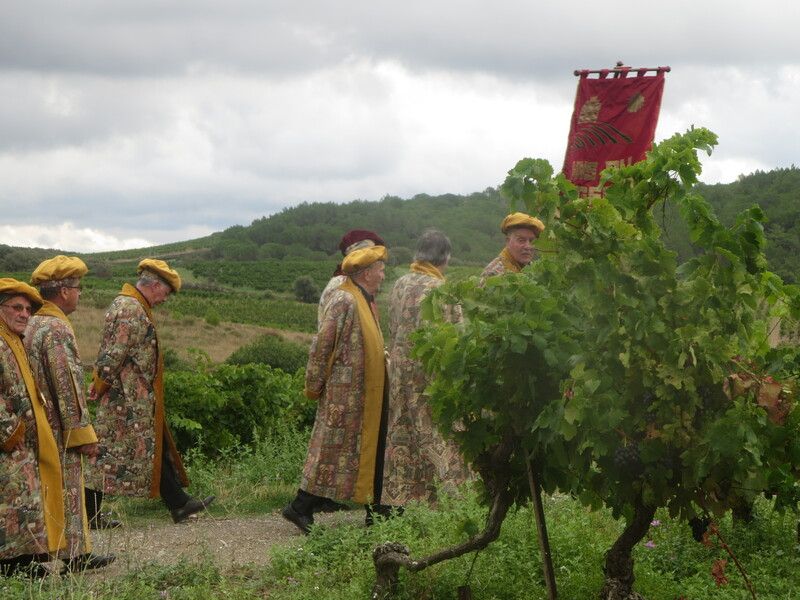 They are everywhere and form the world’s biggest vineyard area, producing one third of all France’s wine. Vines stretch over hill and valley, coastline and plains. 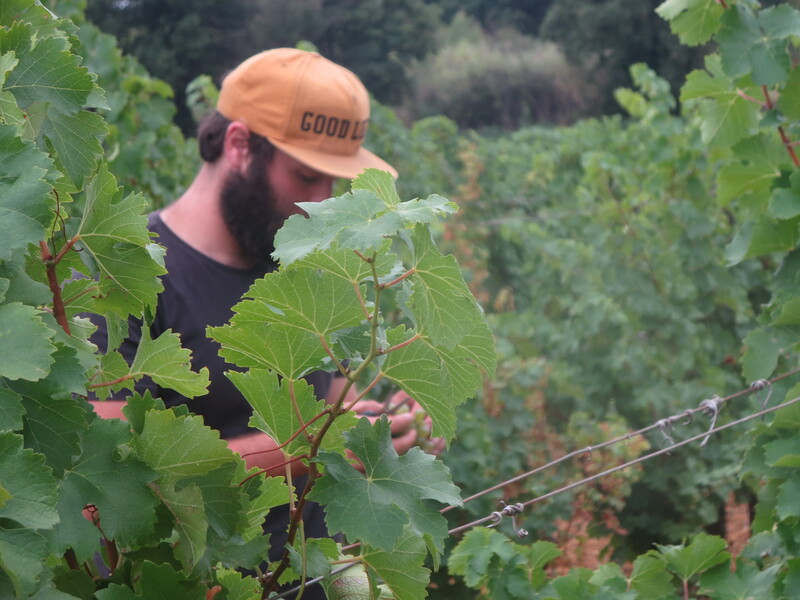 As you walk around it is easy to think of vines as all being the same, part of one big plantation, but when we have received visitors and we go on walks through the vineyards they often ask me what sort of vine we are passing. Cue guesswork on my part unless I am in the vineyards of Mas Coutelou. 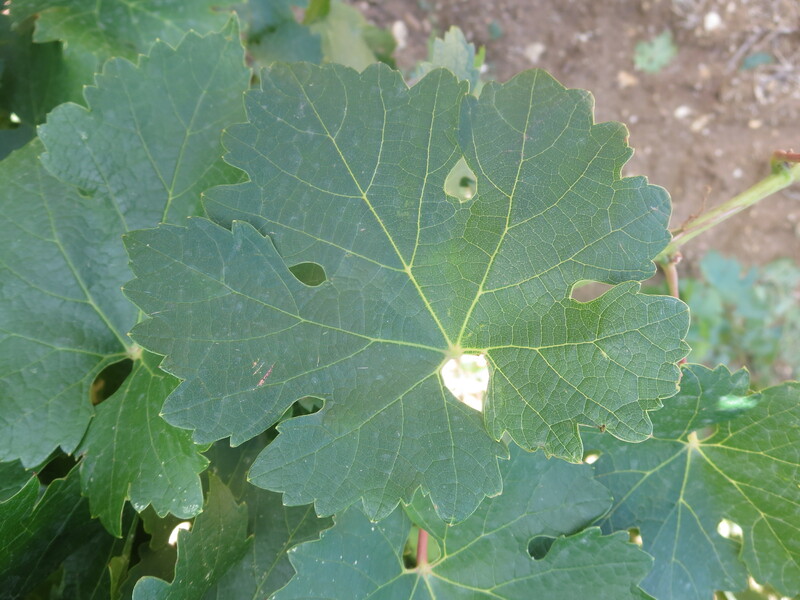 To remedy this ignorance and to meet the brief at the top of this blog that I should be “learning about wine, vines and vignerons” I set myself the challenge of being able to identify the main types of vine in the region. 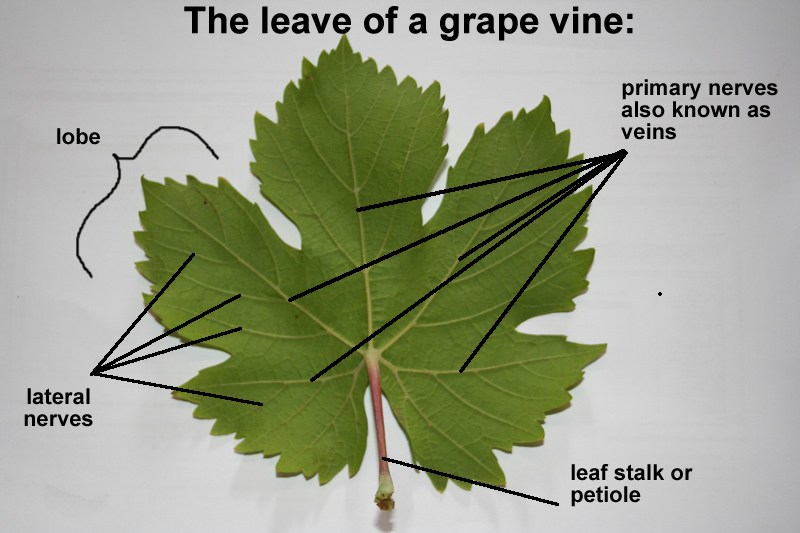 Ampelography is the study of identifying and classifying grapevines. There are many learned books on the subject, some running to hundreds of pages. However, I wanted a simple guide, to learn the basic varieties before expanding to others. 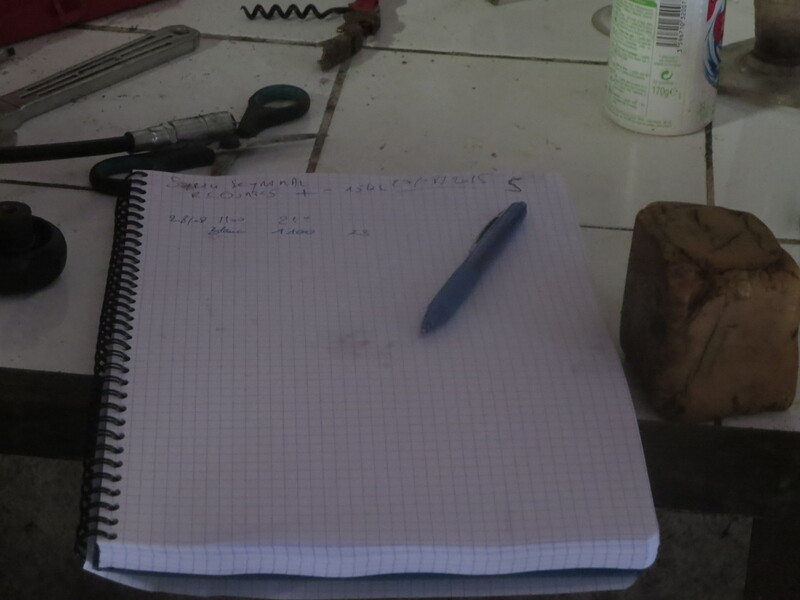 I took some photographs in the parcels of vines of Mas Coutelou and using the internet and Jeff himself I hope I have put together a simple reference piece. As we enter harvest it has proved useful to me so that I know what I am picking or sorting. Hopefully it will be useful to you too, whether you visit vineyards or just take an interest in wine and vines. 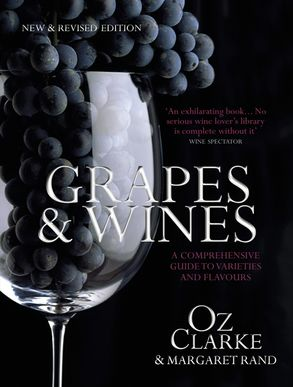 Experts use features such as the shape of the grape bunches, size and colour of the grapes. 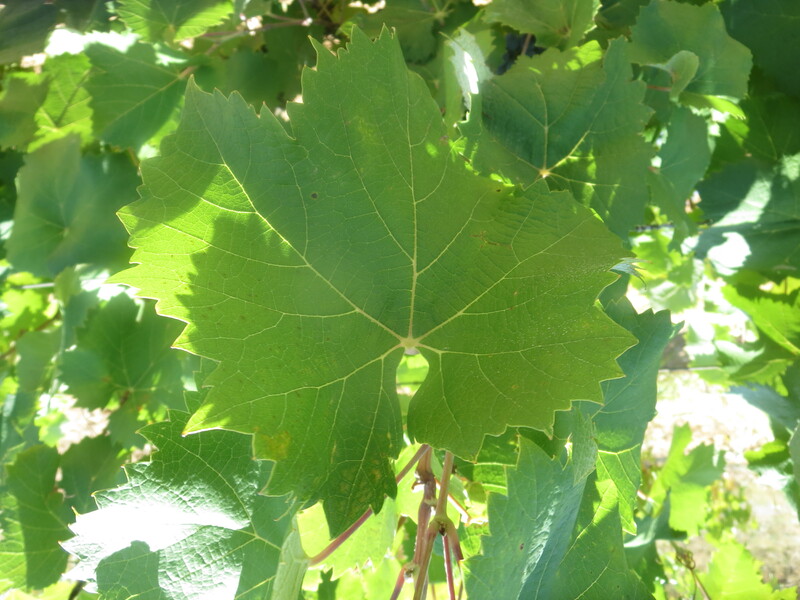 However, for me the most obvious way of distinguishing between vines are the shape of the leaves. The colour of leaves varies but so too the number of lobes (from just one to seven), the colour of the veins and the shape of the sinus around the stalk (pétiole). The sinus is the gap between the lobes. 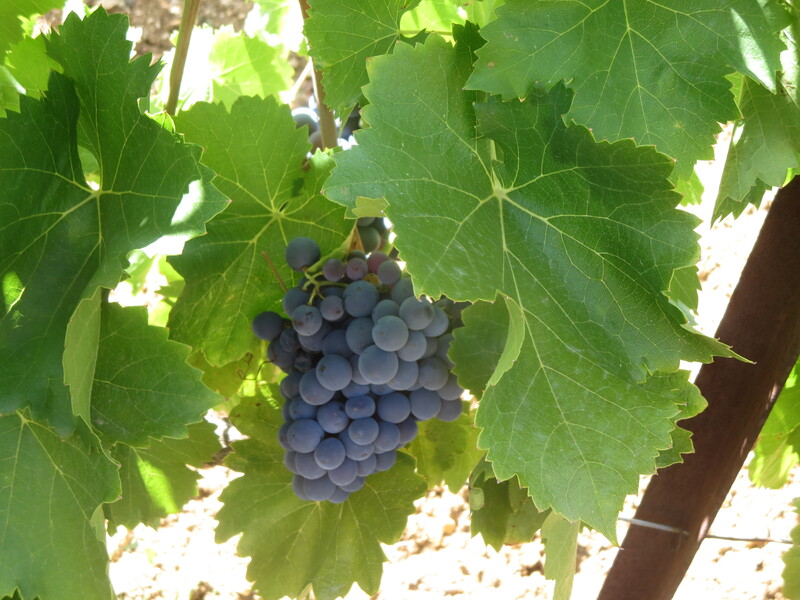 So here is my simple guide to identifying some Languedoc vines. I have started in this post with the five main red wine varieties. 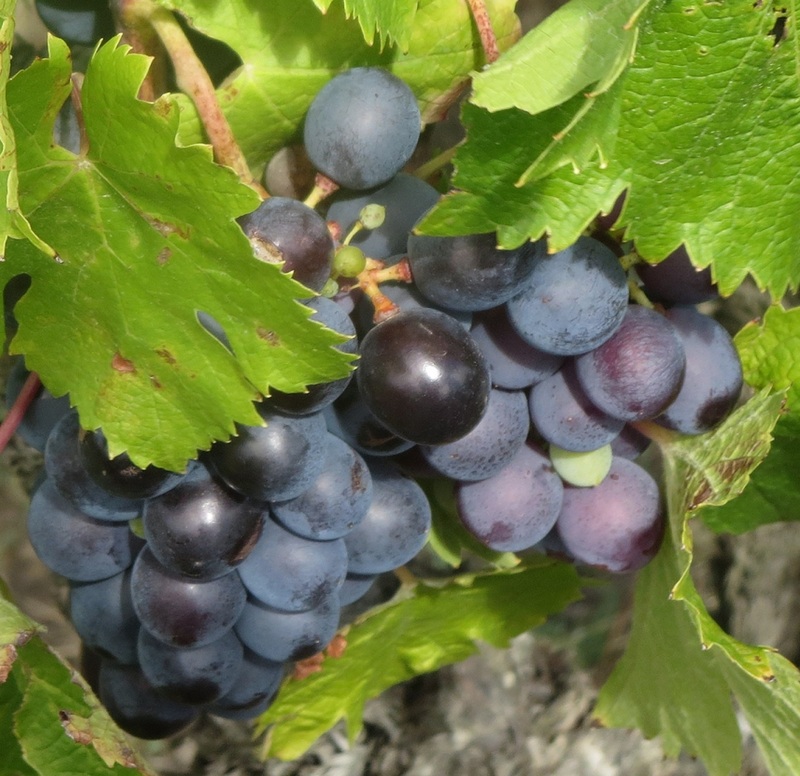 Syrah is one of the great varieties of the Languedoc. Famous for its wines in the Rhone Valley and around the world (Shiraz in Australia) Syrah produces great wines here too. The leaves are quite a light green in colour with 5 lobes which are well separated out including a big sinus (V shaped) around the stalk (pétiole). The veins are quite light and stand out. The leaf edge has small, gentle teeth shapes. The grapes tend to be oblong shaped and fairly small in size. 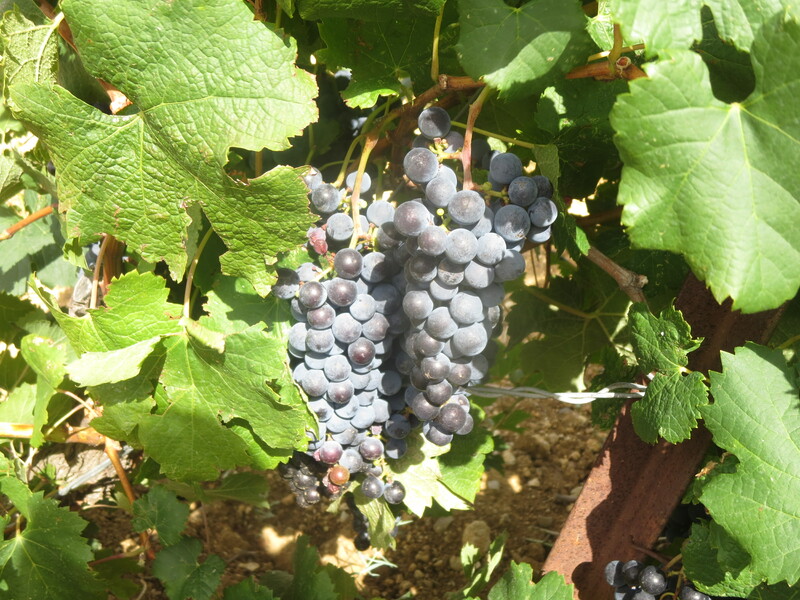 Syrah is one of the earlier red varieties to ripen. 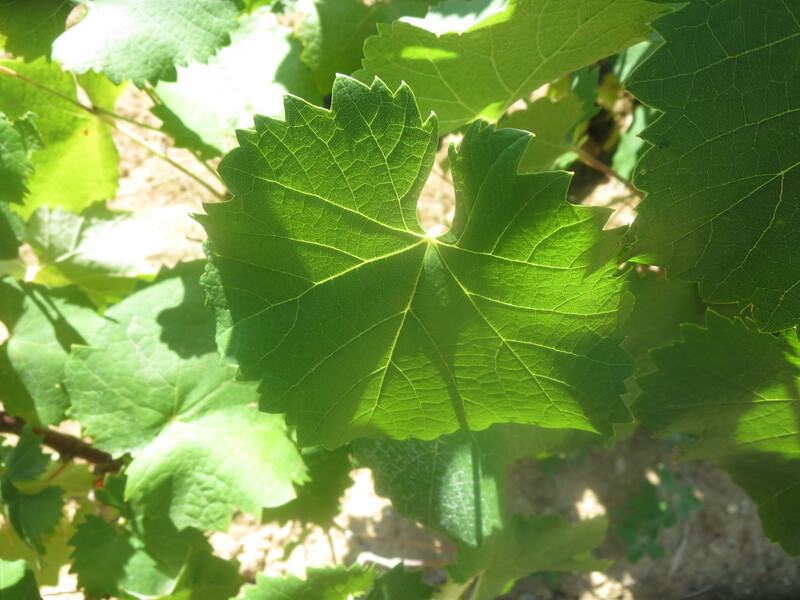 A variety which loves the heat, very much a Spanish and Mediterranean grape. 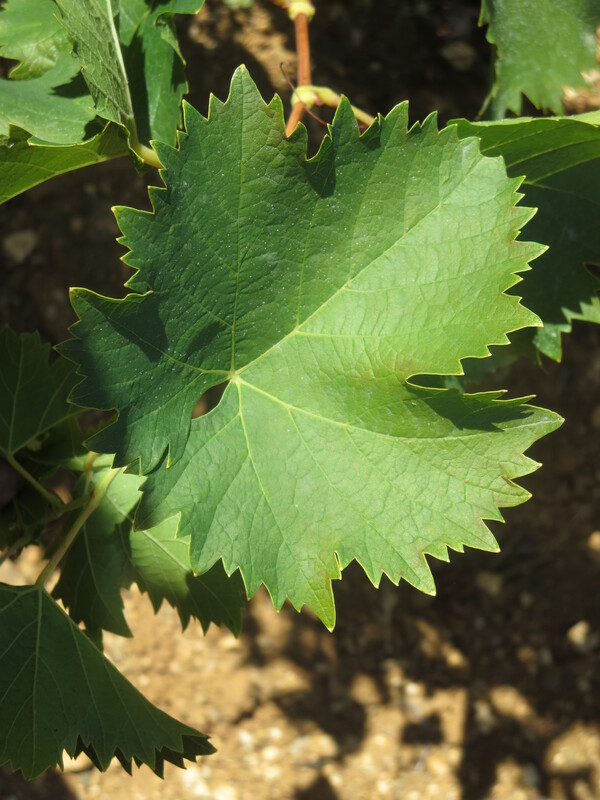 Grenache leaves have a more round appearance than Syrah with big, wide lobes which are not so separated as the Syrah giving the impression of a big, whole leaf. There is a wide sinus around the stalk. The leaf edges have saw teeth which are quite marked. Light veins and round, medium sized grapes. 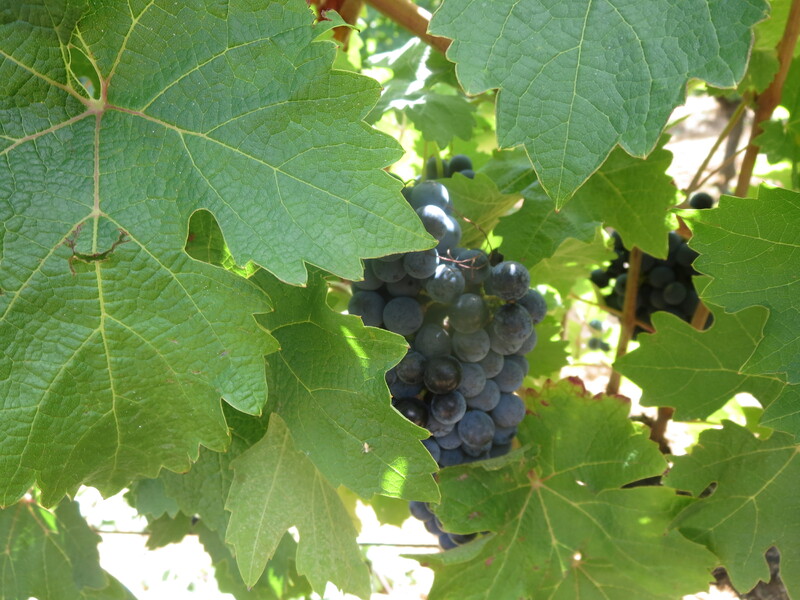 Grenache is a late ripening variety. Often used to blend it is not often used for single variety wines. 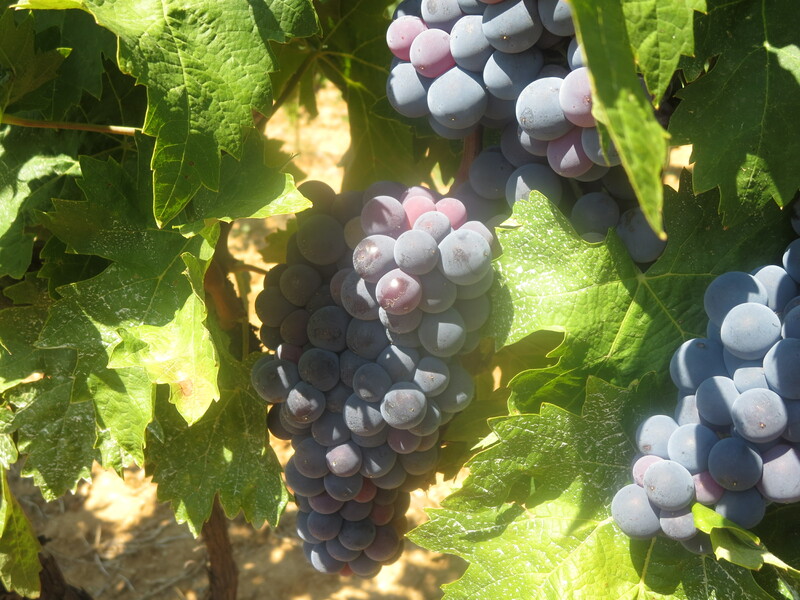 Mourvèdre is a late ripening and, sometimes, a difficult grape to ripen. The lobes are broad and form three rather than five as you can see in the photo on the right of the page above. There is a little green colouring in the veins and the sinus around the stalk is a lyre shape. The teeth around the edge are distinct and quite big all around. The grapes come in biggish bunches though the grapes are medium in size. 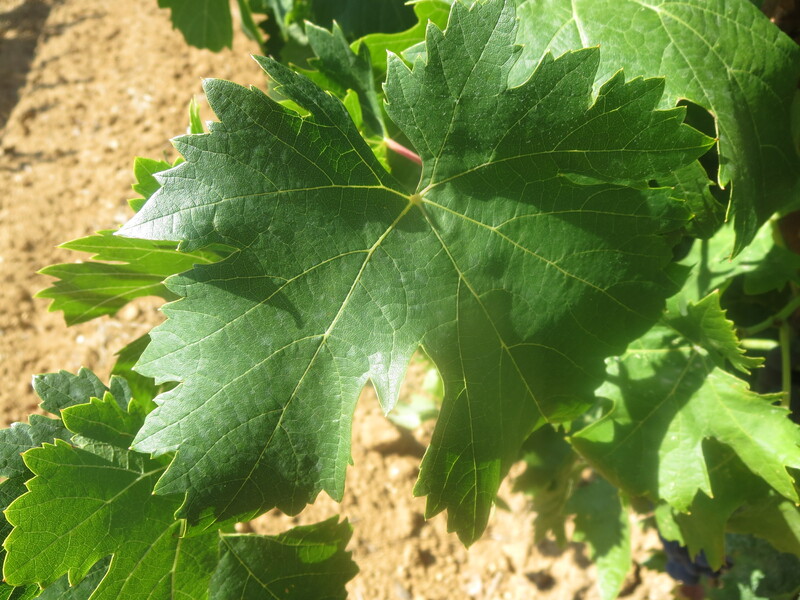 Carignan has big leaves which are quite hairy underneath and have a more dimply appearance than most in the upper surface. Five lobes usually though in the photo above the lower lobes are small with big upper lobes and a distinct top lobe. The teeth are tapered and distinct. The veins are hardly coloured. 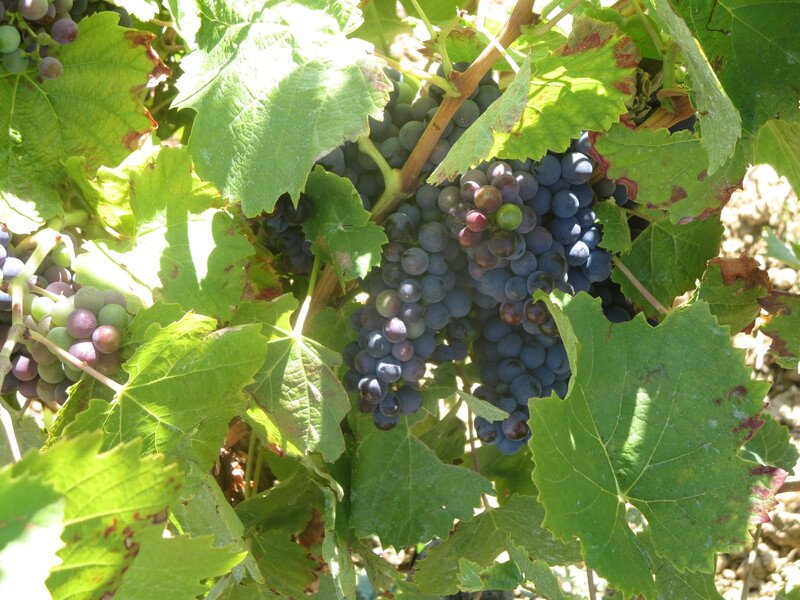 This is a late ripening variety and you can see the grapes below which are still turning black, even though this was taken at the same time as the other photos. The grapes and clusters are medium to large in size. 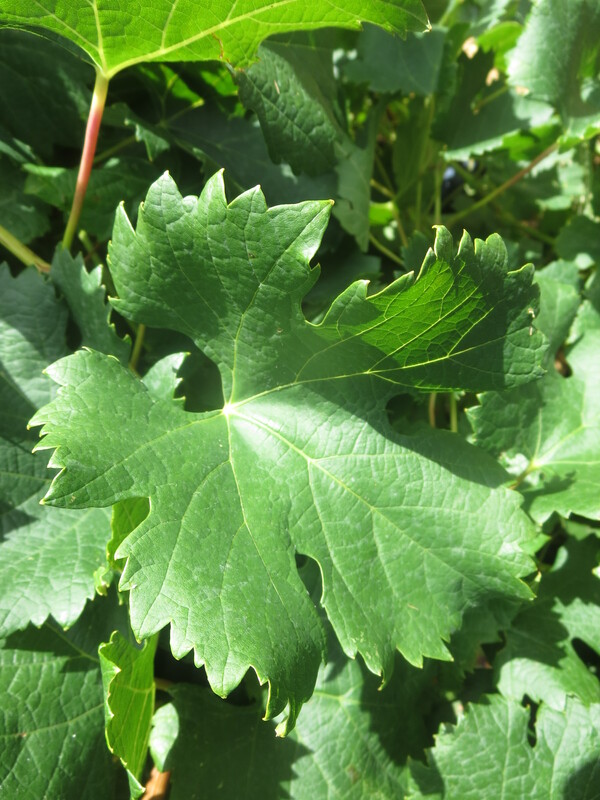 I like to think of Cinsault leaves as being very like the grape’s flavours, open, friendly and welcoming. These are big widely spaced lobes and a deep, open sinus around the stalk. The veins are light and clear and the teeth are big, almost rounded which cover all the leaf edge. 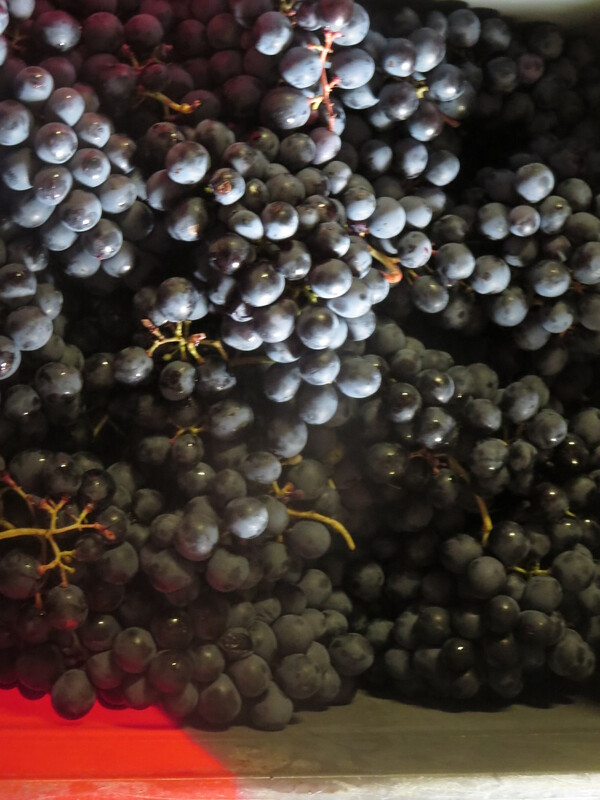 Often used in rosé wines Cinsault is starting to be used to make some great red wines in the region. 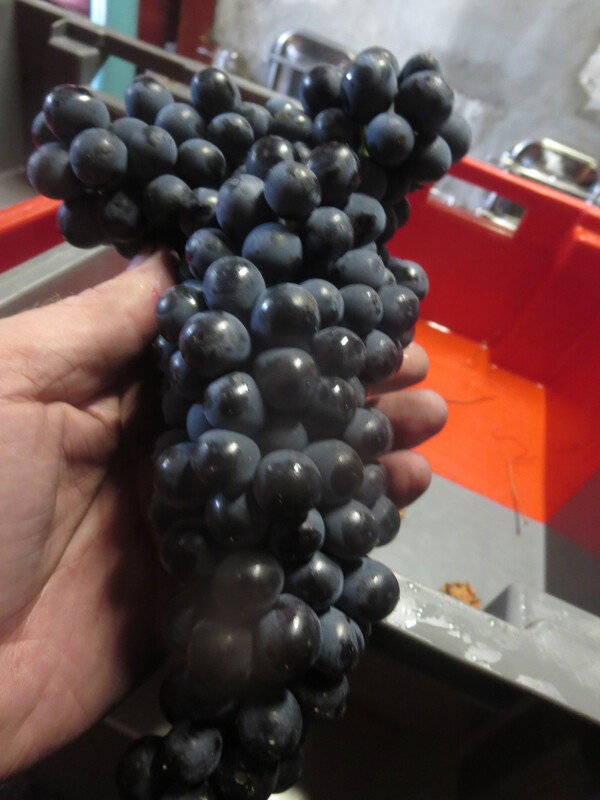 Cinsault grapes are big and form big clusters. Categories: Vines | Tags: ampelography, Carignan, Cinsault, Grenache, Languedoc, leaves, lobes, Mourvedre, petioles, sinus, Syrah, vines | Permalink. 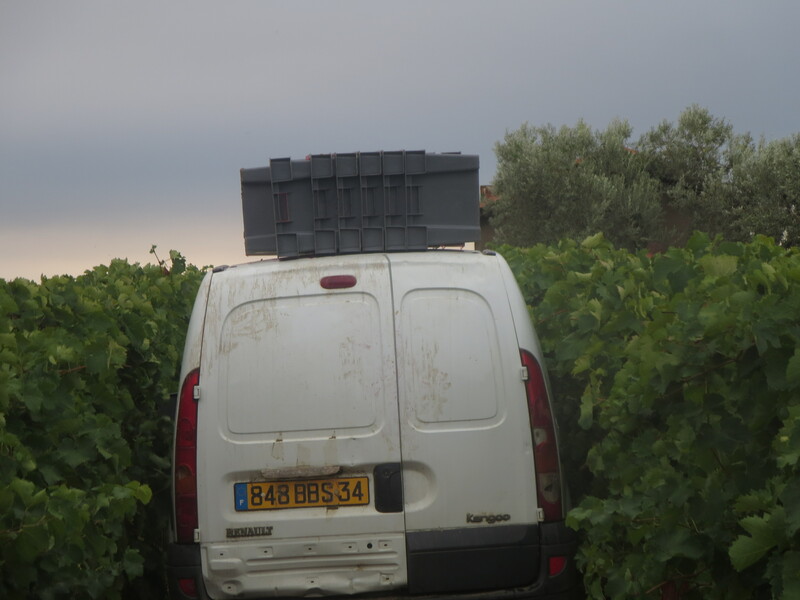 When I arrived in Puimisson I was rather taken aback to find Michel turn up with a van full of grapes. Jeff had decided that the Muscat was ready and there was no reason to delay. 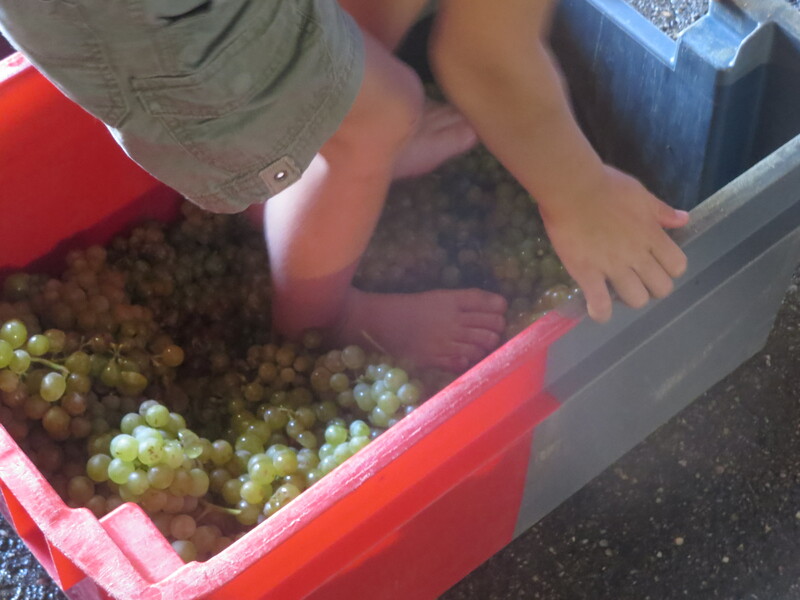 Blogger and teacher David Farge was present with his young son Jules who got things flowing by treading the grapes. 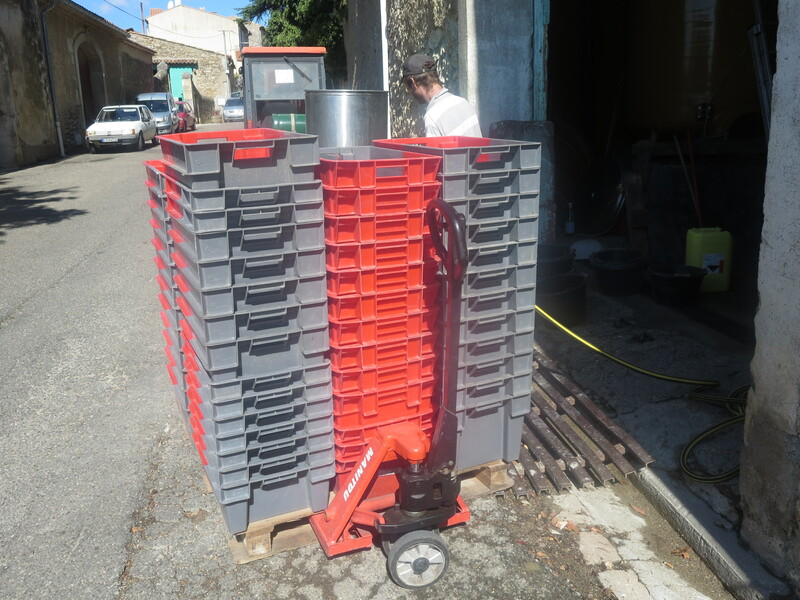 A dozen cagettes of grapes were quickly transferred to the small press and the first juice of the 2015 vintage was flowing within a few minutes of the grapes being picked. 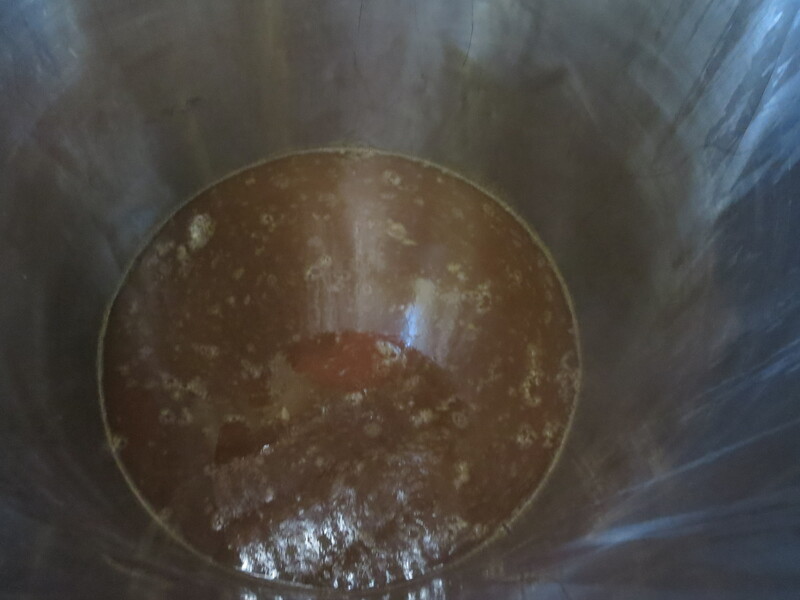 The first juice was showing around 11,5 degrees of alcohol which will develop into around 13 to 14 when finished. 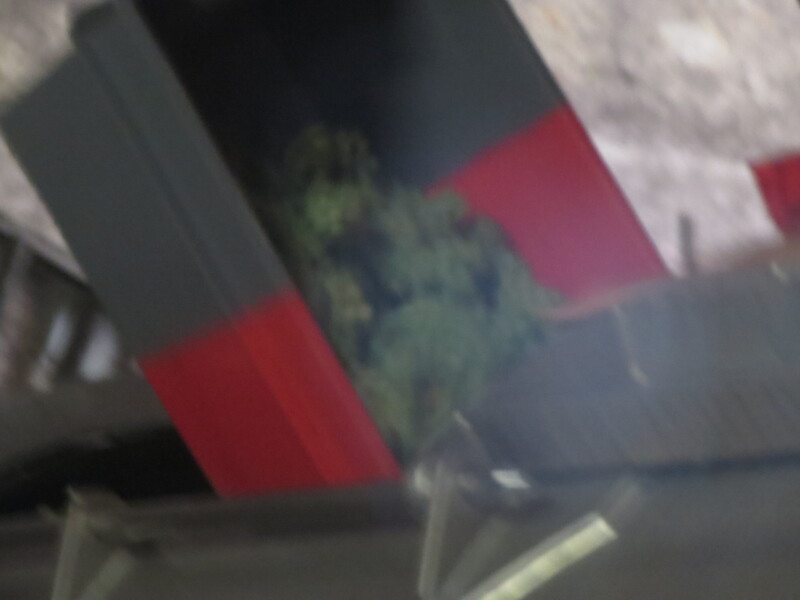 Three pressings were made with stronger juice flowing. 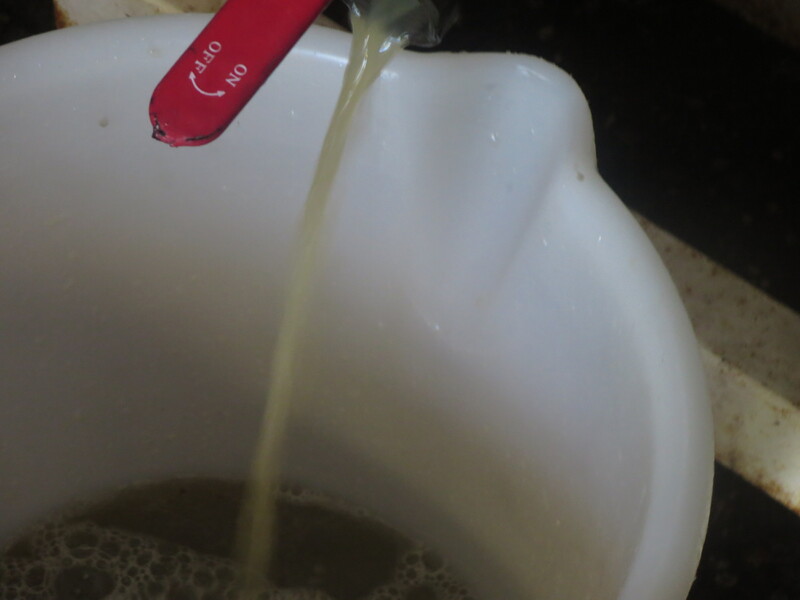 And the fermentation was starting almost as soon as the juice flowed as you can see in this bucket. If only there was smellavision to let you share the glorious juicy sweet grape aromas which filled the cuve and the cave. And of course the juice tasted just lovely. And so, it has started, the vendanges are underway and next week things will move onto a much bigger scale. As you can see everything is ready. And the team is now already in the groove thanks to the muscat. Categories: Vignerons, Wines | Tags: 2015 vintage, alcohol, cagettes, fermentation, Muscat, treading the grapes, Vendanges | Permalink. 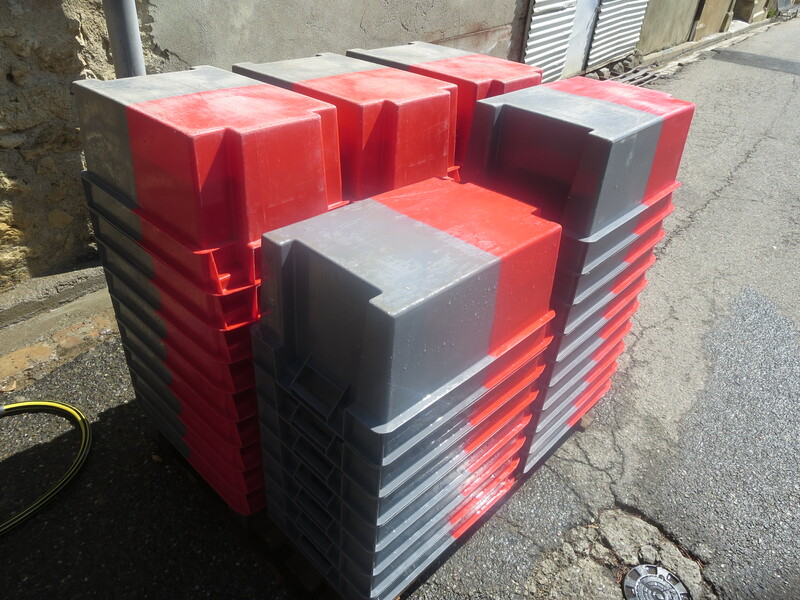 These plastic boxes haven’t appeared for a while, but they are a sure sign of what is soon to come. 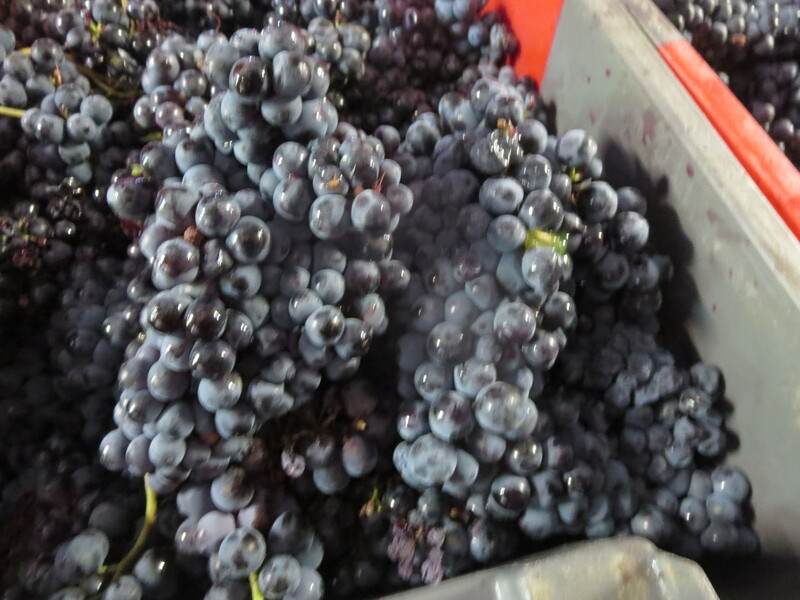 They are, of course, the cagettes vendanges, into which the grapes are placed when they are harvested. Today (August 19th) and the last few days have seen hard work in cleaning and preparing. 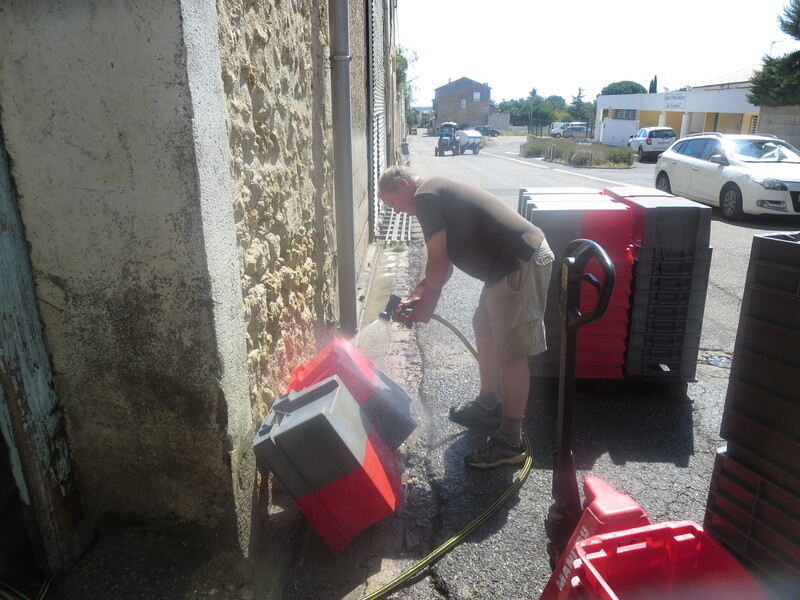 I wrote earlier this month about the work which has been carried out to repair and update the cellar and work brings dust and debris which have had to be cleared up. Then everything has to be pristine ready for the start of picking. 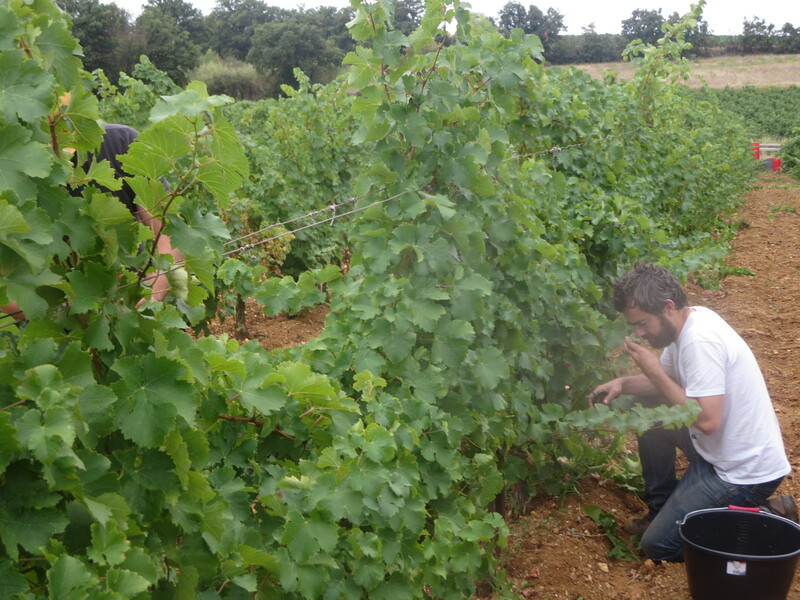 All vignerons will be doing this but when you make wines without the safety net of sulphur cleanliness is even more important. Well it is one way of staying cool on a hot day. However, job accomplished. 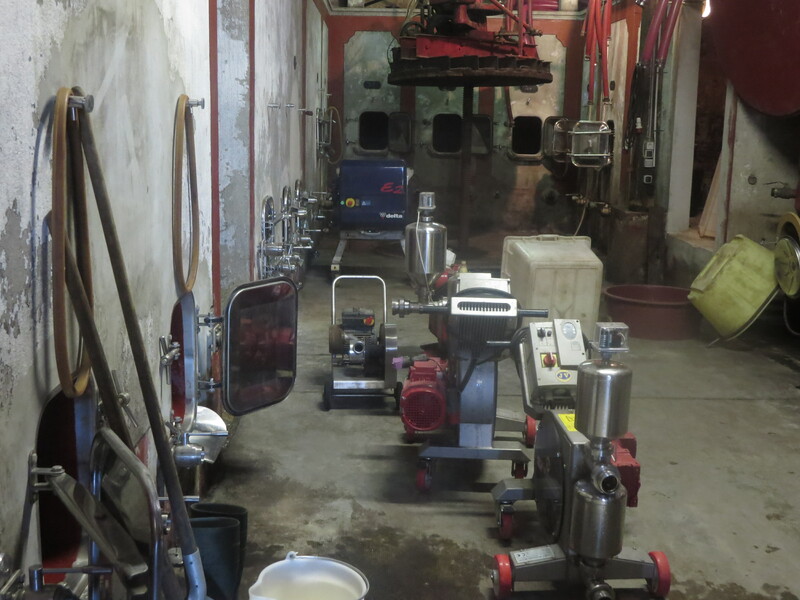 Inside the cellar the new cuves have to be prepared too with new equipment, Michel and Julien were busy with that. 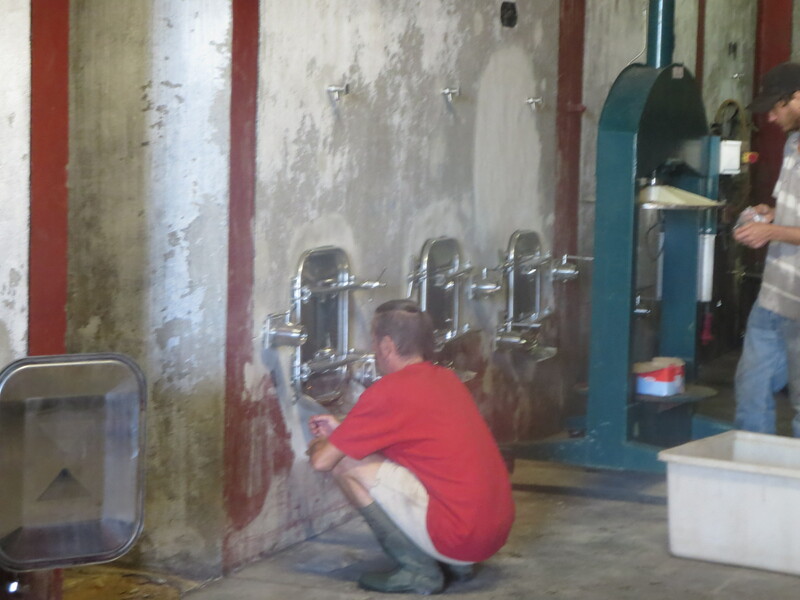 Jeff was busy too, moving some of the fibre glass and stainless steel cuves into position so that when harvest begins the grapes can be moved as quickly as possible into tank for fermentation. Indeed everyone was busy except for one member of the team who decided that this was all beneath him, besides that water is not something which appeals! The harvest itself is likely to begin next week, Monday or Tuesday. Recent weather has been cooler at night and this will help keep the grapes in good condition but they are not quite ripe just yet. Having tasted a few in recent days the juice is getting sweeter and but the pips are still green and hard. 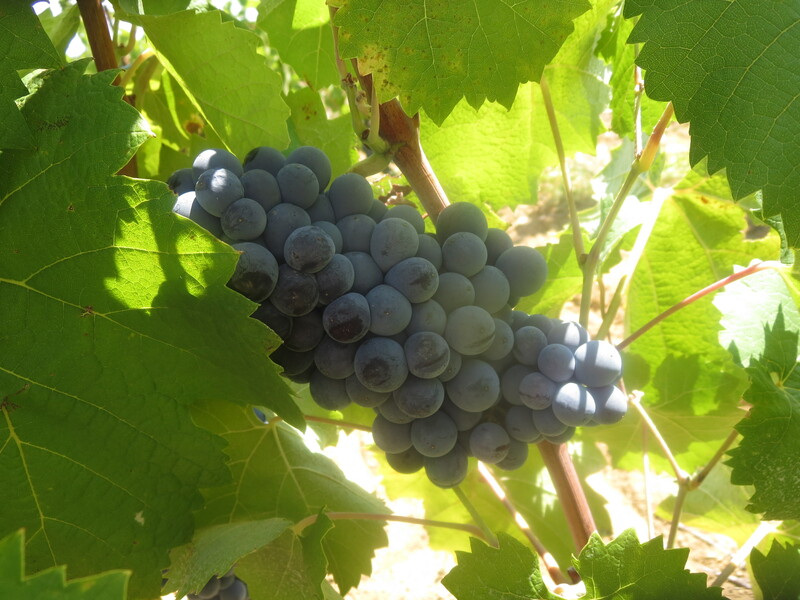 They are healthy though and some, like the Syrah, look tremendous. As the hard work will begin shortly it was a timely occasion to celebrate last week. Jeff’s father and niece celebrated birthdays and a very enjoyable party was held on Sunday at Rue De La Pompe. Some bottles included a 100% Mauzac from Plageoles, a Gaillac wine which confirmed for me that Mauzac is the best of white wine grapes in that region. (See here). 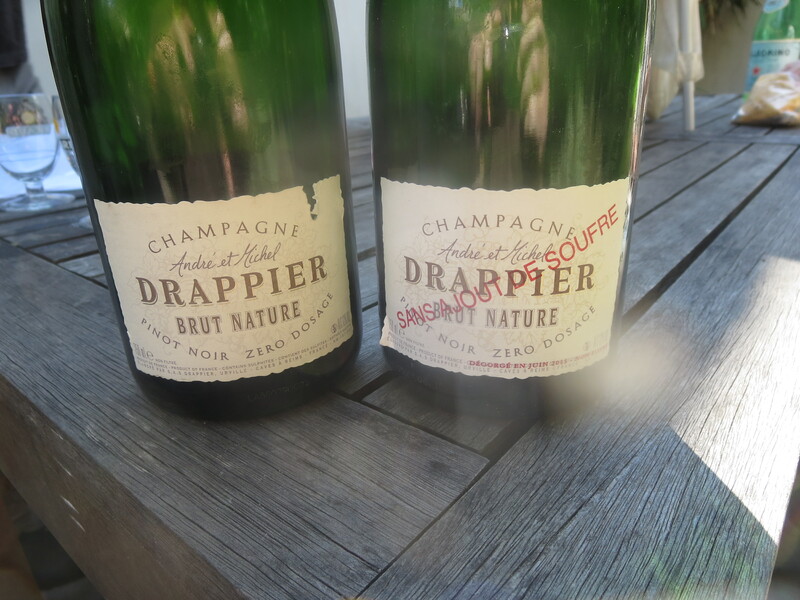 And two lovely champagnes from Drappier with no dosage of sugar added and in one case no sulfites. Natural wines are beginning to influence all regions and some big names. Naturally the stars were closer to home however. Lots of great wines including Coutelou classics such as Classe, La Vigne Haute, Vin Des Amis but also some new ones for me. 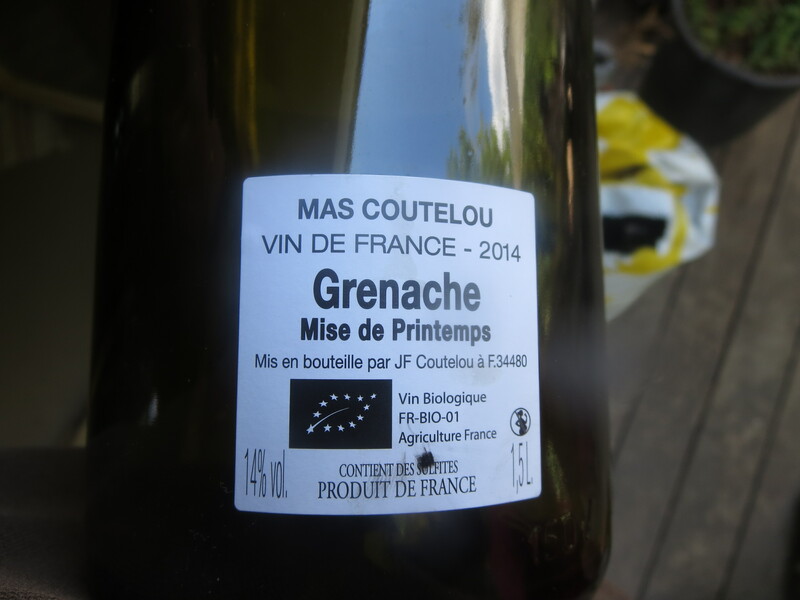 Grenache Mise De Printemps was lovely velvety and fruity, a great rejoinder to those who say Grenache can’t make good wine without blending. And it had the most lovely aromas. ‘Snowball’ is a white wine of real texture and depth, very long. The celebrations went on long into the night and things got a little hazy including my camera so this photograph is not one of my best. This was Jeff’s first sparkling wine made in 2007 and in fantastic condition, fresh, clean and very full. So much for natural wines being only for the short term. Now the countdown is really ticking so that this year’s grapes can produce wines of such quality all over again. Or indeed, even better. Categories: Tasting, Vignerons | Tags: cagettes, cleaning, cuves, Drappier, Gaillac, Grenache, Mauzac, Plageoles, sulfites, Vendanges | Permalink. 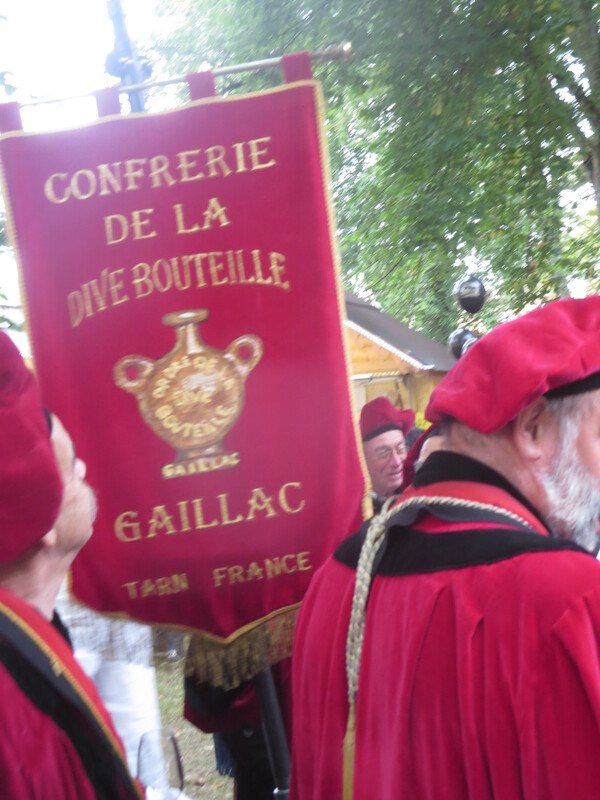 The annual Fête Des Vins de Gaillac was held this weekend and as it was almost 20 years since I last attended and now live just 100 miles away it was a welcome opportunity to return. This photo taken at the time shows that the event then was a simpler affair but I always remember it fondly. No less so this year though my damp shoes and muddy trousers may take some sorting out. It poured down. Most of Saturday afternoon and a little more on Sunday morning for good measure. The vines needed it but it was less than ideal for an outdoor wine tasting. 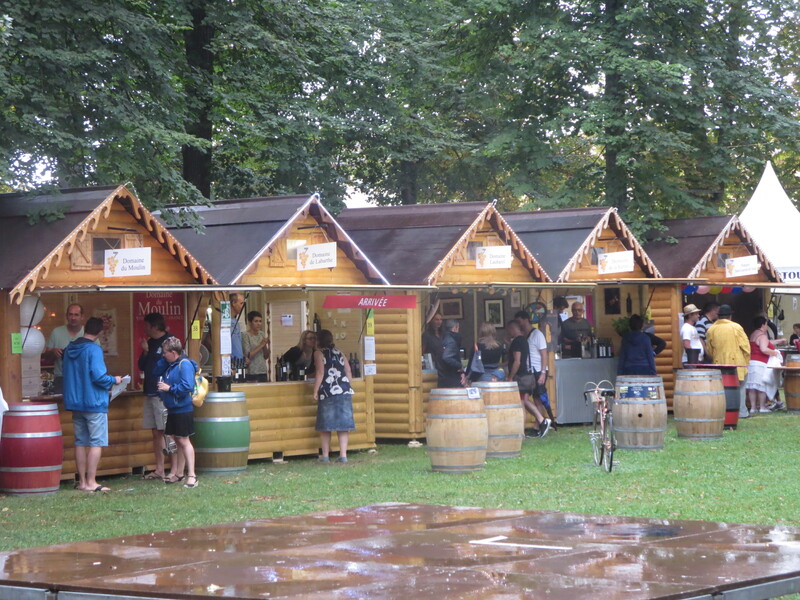 Wooden lodges replace the tents. 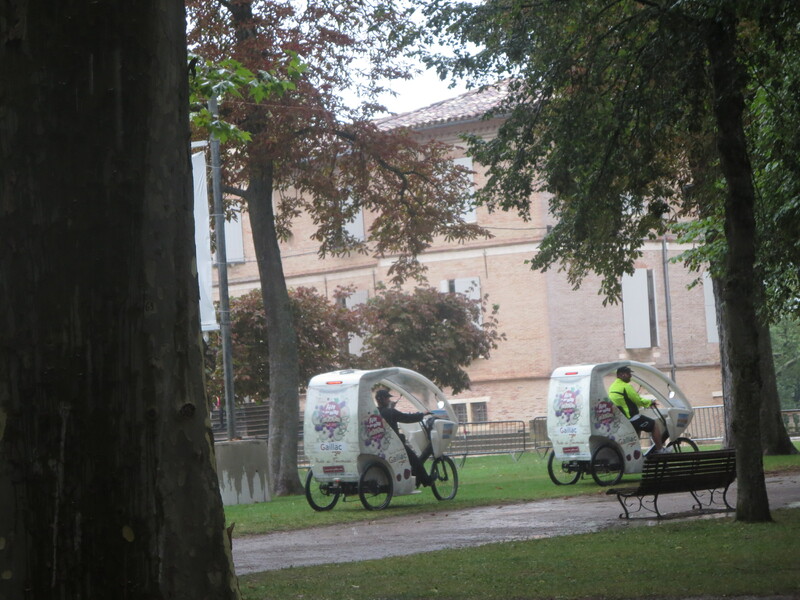 Anyway the weather failed to spoil the event which was well organised with plenty of food tents, handy cycle powered rickshaws to carry wine back to your car, (fortunately powered by someone else!) and wooden lodges for each producer with handy panels to provide a roof which was, mainly, waterproof. Certainly a step on from the tents 20 years ago. Plus free delivery within France if you bought 24 bottles, a very helpful gesture. 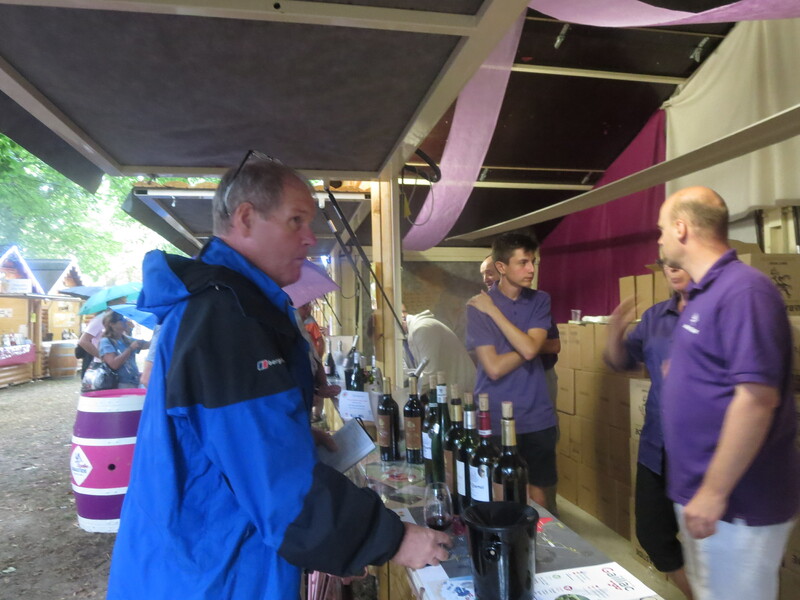 I enjoyed the Fête, I enjoyed some of the wines and bought two cases of various bottles. I could have bought more, so though I do have some negative comments please bear in mind that I am a fan of Gaillac and its wines. Tough love. So, to the wines. One reason I remember Gaillac so fondly is that it was the first time I had come across white grapes such as Loin D’Oeil (sometimes written as Len De L’El), Mauzac and Ondenc and red grapes such as Duras, Braucol and Prunelart. These provided a welcome change to the Chardonnay, Cabernet Sauvignon and Merlot wines which dominated in the 80s and 90s. 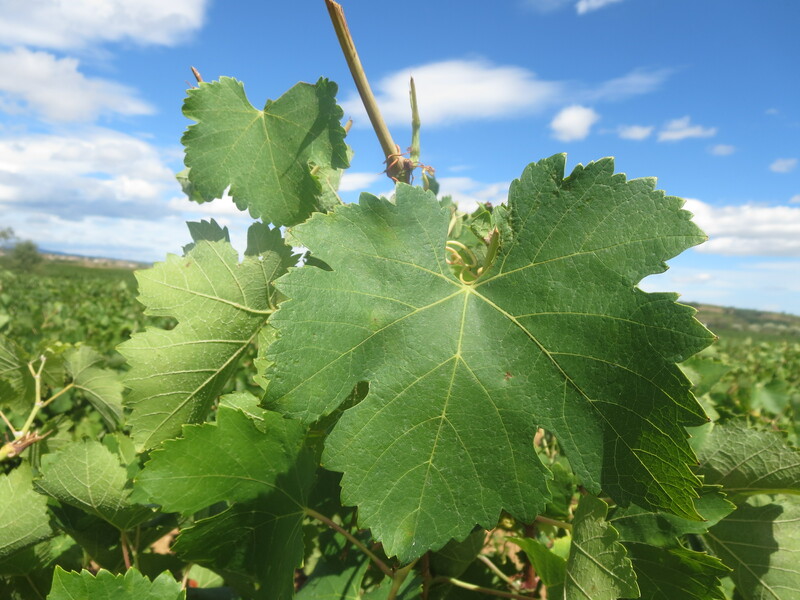 In fact local winemakers had started to take out some of these local varieties and plant the more common grapes along with Syrah and Sauvignon Blanc. Commercially this made sense at the time but it has left the region with a bit of an identity crisis which this weekend highlighted for me. 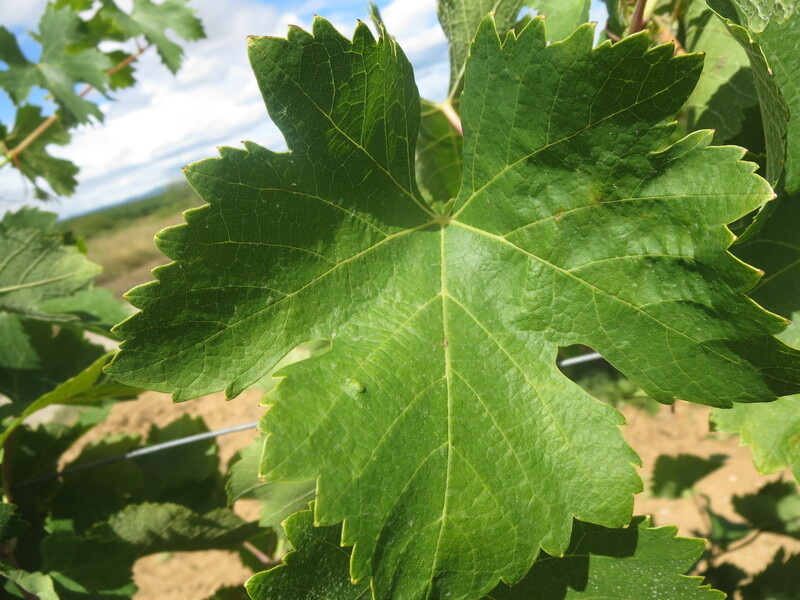 The local varieties still dominate but winemakers differ as to the use of the new varietieses, do they use them to blend or to dominate their wines. It was noticeable that many wines are moving back to the traditional varieties, suggesting the incomers are being taken back out? Lots of different routes being taken but choice is good, there are some wines you might not like but others which you certainly will. Just a little confusing in places. 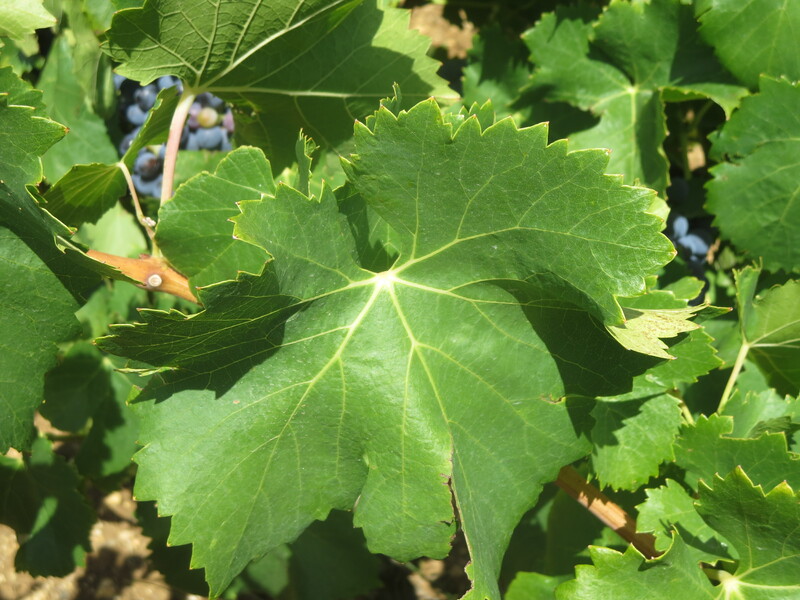 More can be read about these grape varieties on this excellent site from the Gaillac wine organisation. Some have also gone down the route of monocépage, single varietal, wines which did not show that well to my taste at least. Blends worked best and often the ones using local grapes only. Or is that my prejudice at work in that I prefer the idea of using vieux cépages? A third issue was the use of oak. 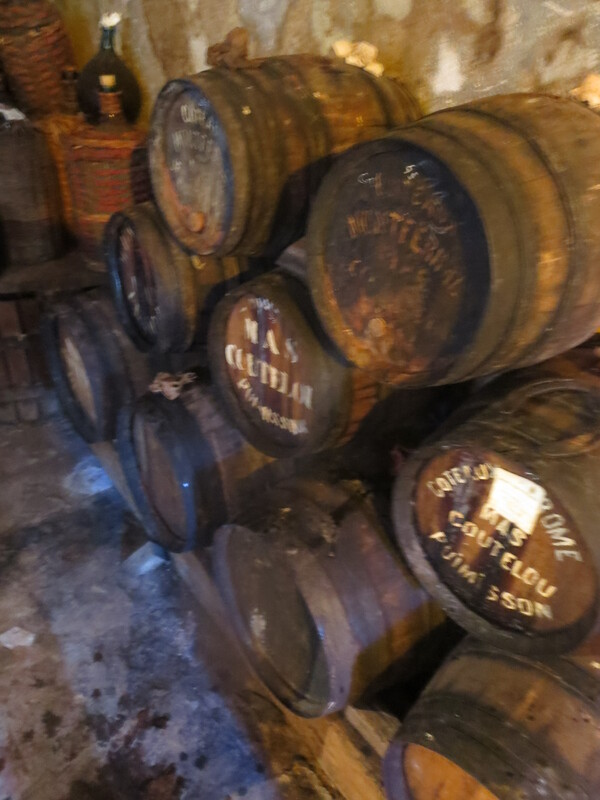 It is very common in Gaillac to age wine in wood, usually oak though some acacia barrels too. I found some good examples of well judged use of wood to enhance flavours and add complexity but there were quite a lot of wines which were dominated by the wood which had only served to dry out the wines and make them feel a little tired. There were some good, fresh wines but it seems to be a badge of honour to have used oak, you’re not a serious winemaker unless you have. Again for my personal taste I disagree. The sheer range of wine types also offers some sense that this is a region trying to do all things. 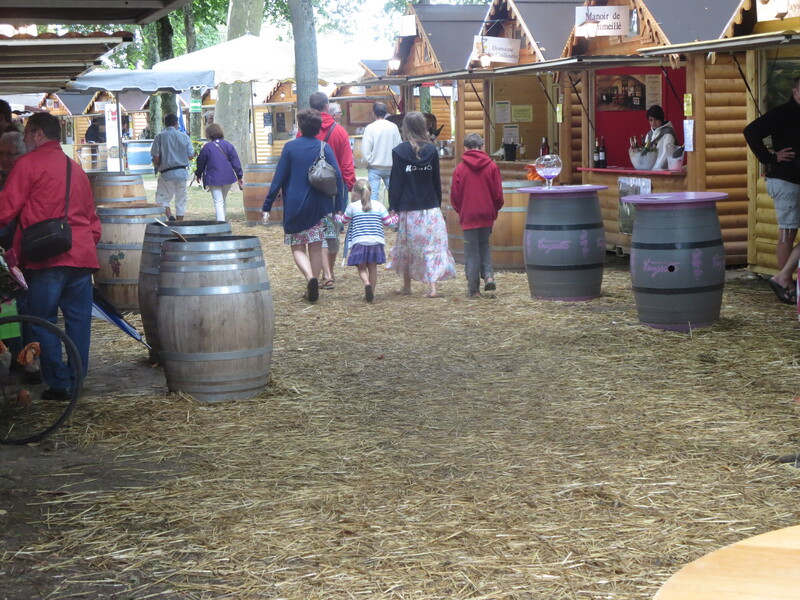 I tasted the range of wines from around 20 vignerons, around 130 wines in total. Yet I didn’t taste the sparkling wines and only a few sweet wines. There are so many different white, red, rosé, sparkling and sweet wines that I was a little lost, and that despite being based in the Languedoc with its great variety. 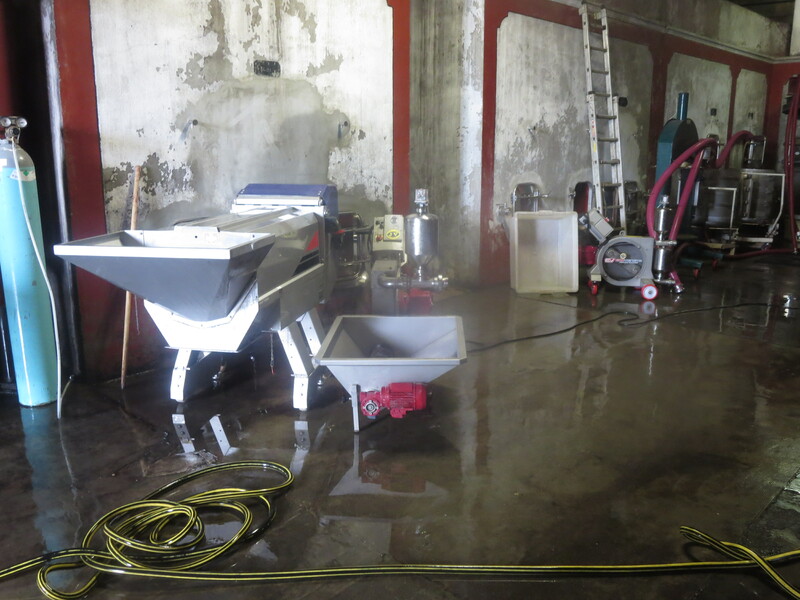 To add to the difficulties facing Gaillac winemakers they have suffered two fairly poor years weather wise. 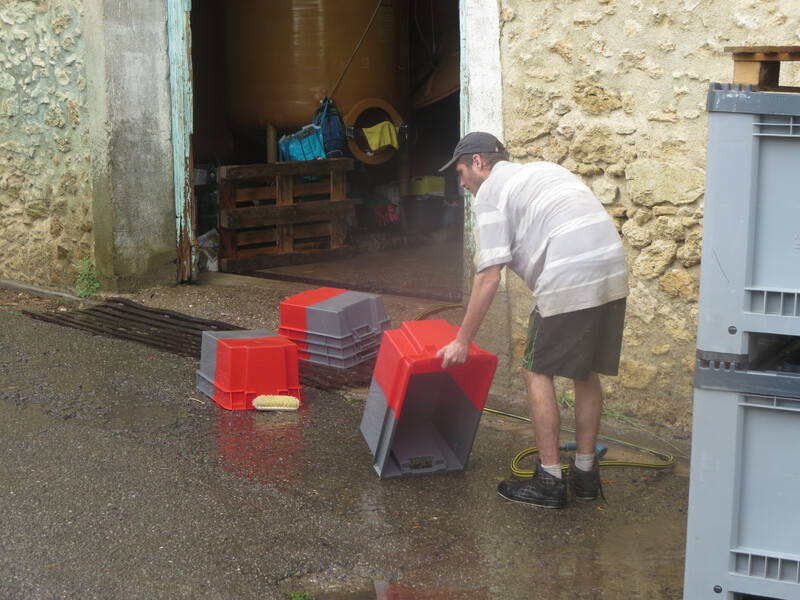 2013 was bad, very wet and many reds didn’t ripen sufficiently, one owner I spoke to said she had written off all reds that year, others have reduced their production to preserve quality. 2014 was better but not much. So, the wines on show tended to be 2012 or older, interesting for the taster to drink more mature wines though, in fact, many would have offered 2012 wines in any case due to the amount of barrel ageing that takes place. I wish them well as the damage inflicted by the weather will be a big financial blow in the next few years. The white wines were, sadly, mostly disappointing. The weather should have made less difference to these in 2013 and 2014, the vintages which were usually being shared here. Loin D’Oeil and Sauvignon Blanc blends dominated but somehow lacked a fresh edge. 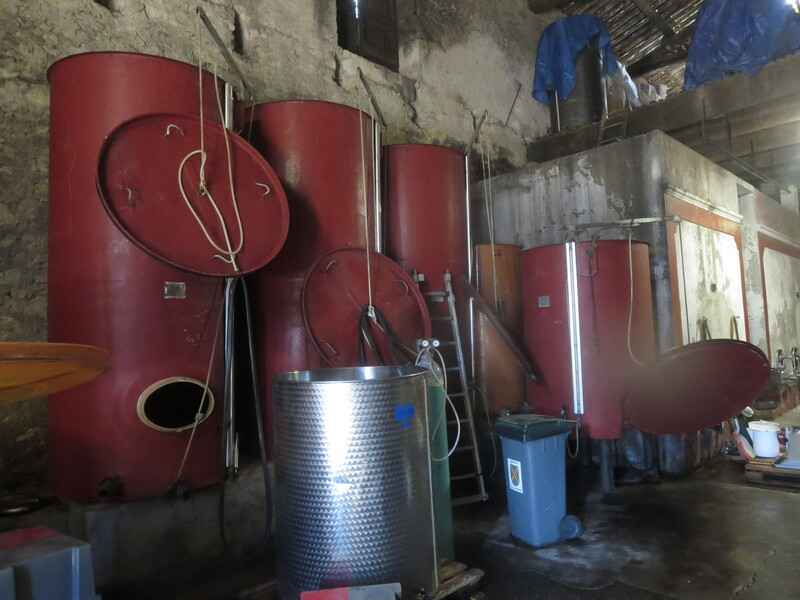 This was true even in the perlé wines, the local speciality where fermentation is stopped to leave some sugars to ferment a little in bottle and produce a spritz or pearl of bubbles, And then there were the oaked whites, often dominated by the wood. 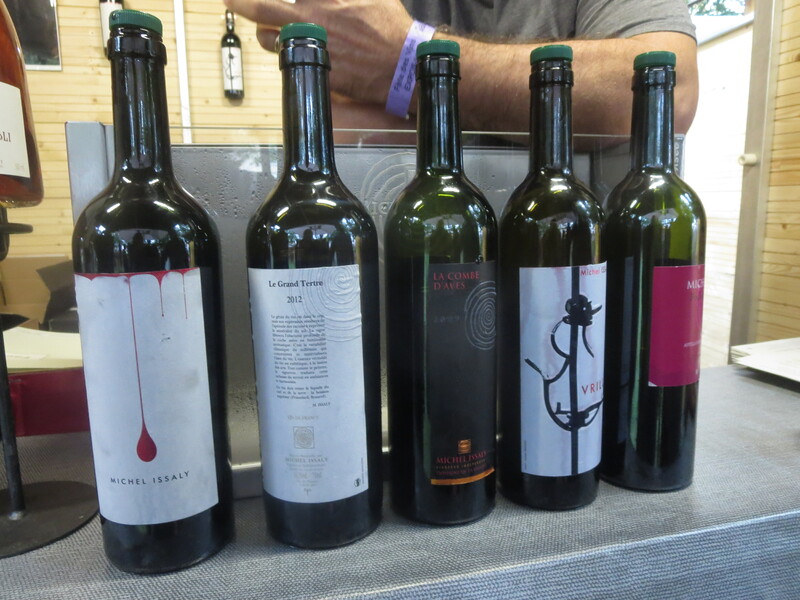 Nevertheless, there were some very nice white wines. 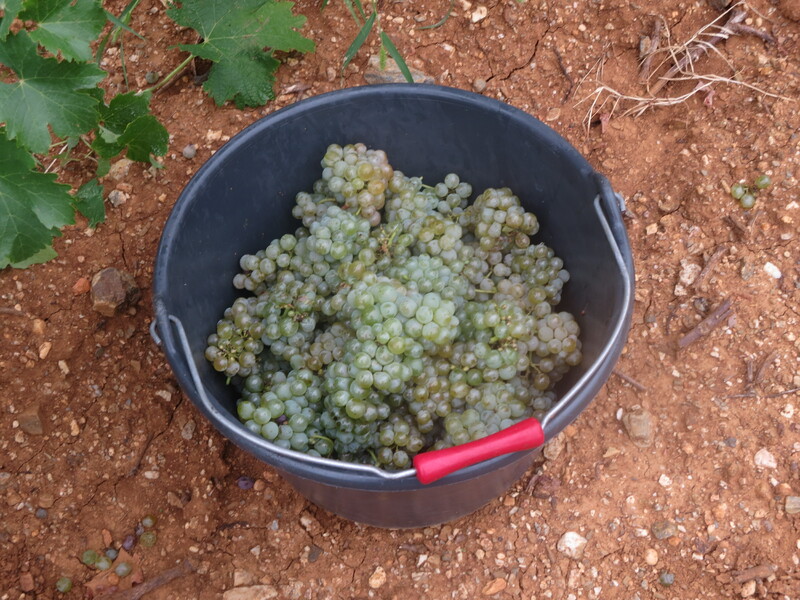 Mauzac was often behind some of my preferred wines, a grape I normally associate with Limoux sparkling wines. That was a concern to me as I am not a fan of Limoux sparkling wines but Mauzac proved to be a grape which really attracted me. Domaine De Lamothe, Blanc Sec 2014, Sauvignon Blanc and Mauzac, nice dry, clean and zesty. 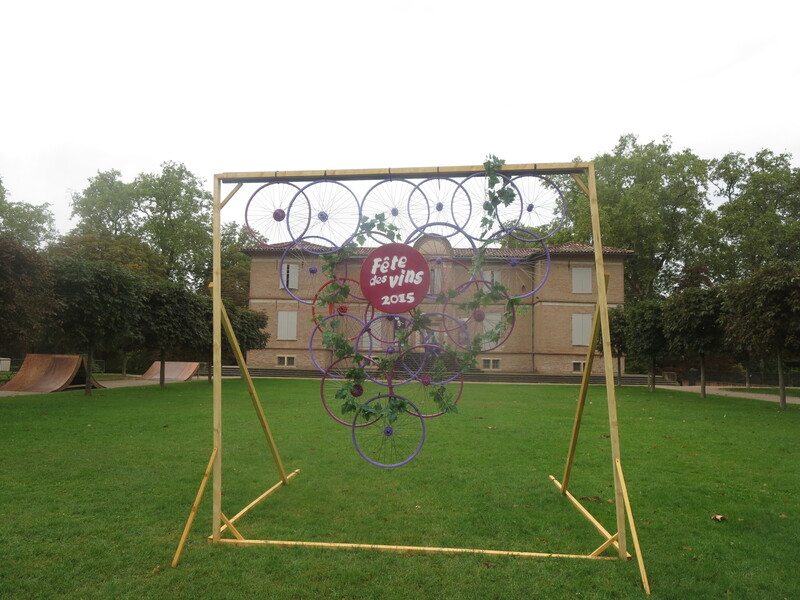 I liked their Perlé 2014 too, it was much drier than others at the Fête with a real spritz. Fresh. clean and quite long. Both of these wines were just 3,80€, real bargains. Clos Rocailleux, Rosé Braucol 2013 and Rosé Duras 2014. The Braucol was textured, fresh yet full, good rosé at 6€. I actually preferred the Duras with a little more zesty character and plenty of red fruit flavours. 8, 50€ and well worth it, indeed I bought some. Clos Rocailleux, the Classique 2012 was good with a real balance between fruit, freshness and depth of flavour. Nice, long, very well made red wine with interesting flavours from Syrah and Braucol, good at 7€. Even better was the Réserve 2012 with Braucol added to the Syrah and Duras and 9 months barrel ageing. Here the wood added to the roundness and flavour, it was a nuance not a dominant flavour, chapeau to Jack and Margeret for learning to use the barrels so well so quickly. 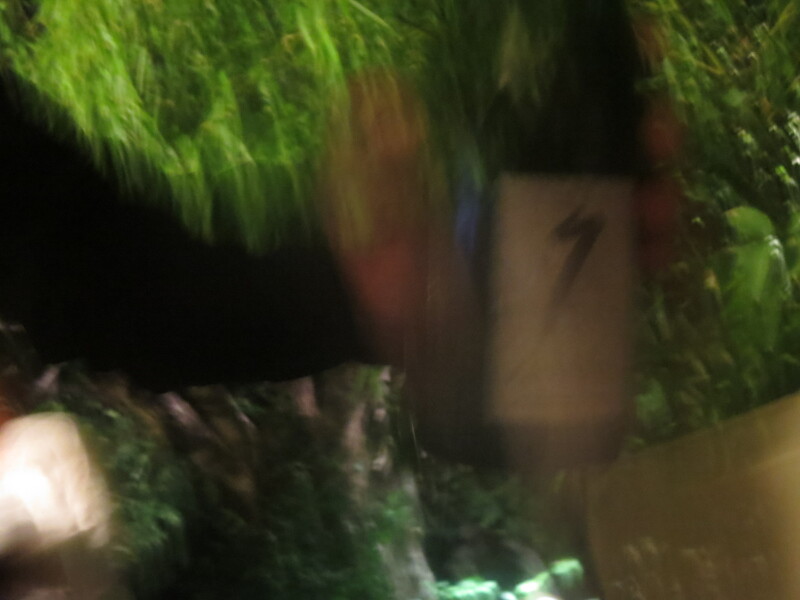 Domaine Ramaye / Michel Issaly, is a natural wine producer whose wines I had tasted before. Vrille 2013, Braucol, Prunelart and Duras produce a raspberry, fruity and very long flavour which was fresh with complexity. 14€. La Combe d’Avès 2009, Braucol and Duras was also fresh and round wearing the years very well and the 24 months of barrel ageing were discreet, 16€. Le Grand Tertre 2012 is 85% Prunelart with some Duras. Aromatic, almost perfumed with deep rich fruits, very good though 25€. Top of the range is Le Sang 2012 85% Braucol and the rest Prunelart, raised ina variety of new and older barrels. Very deep, complex and long, 45€. Fair to say I really enjoyed all of these and they showed off the local varieties very well. A perfect riposte to those who say that natural wines mask the true varietal flavours. 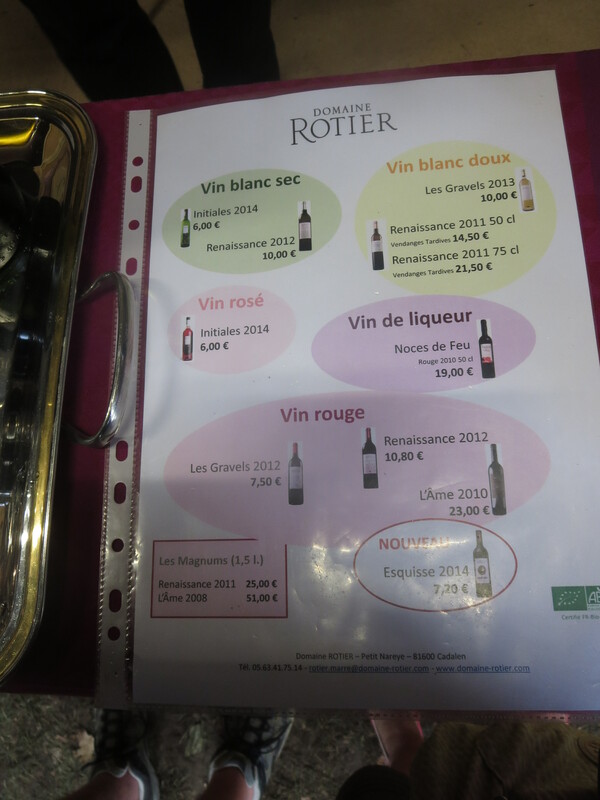 Domaine Rotier are organic producers who now make a nice natural red, Esquisse 2014, classic fresh notes and raspberry fruits, not obviously natural this would appeal to those wanting to try a natural wine, 8,60€. 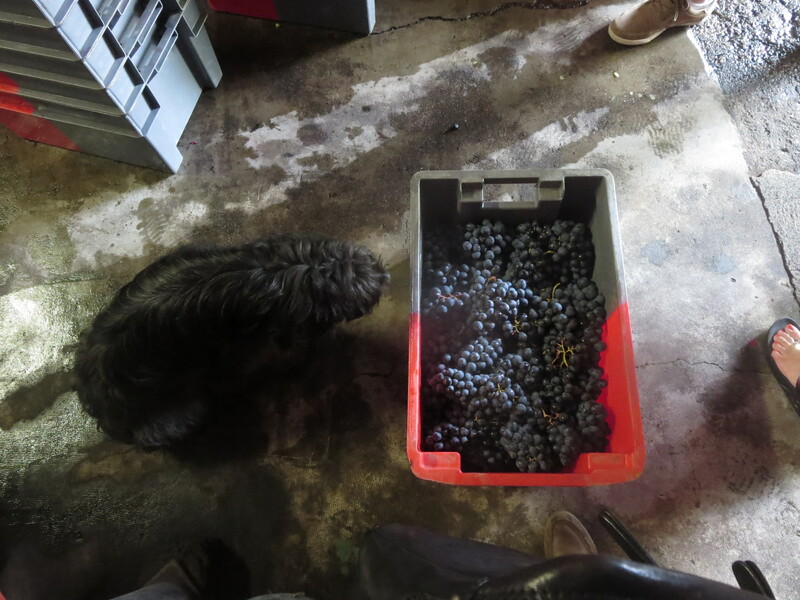 The Renaissance 2012 is raised in oak from Duras, Syrah and Braucol. Round, full red fruits, eg strawberry, fresh and very good, 12,10€. I prefer this to their top of the range L’Ame 2010 which is much bigger and complex, 24,40€. Domaine De Brin, I liked Vendemia 2013 but preferred Anthocyanes 2013, Braucol and Syrah showing well with a perfumed nose of red fruits and forest fruits. Round and long it developed very nicely, 10€, no rush to drink up. Brin De Temps 2013 of Duras and Cabernet Sauvignon had deep, spicy notes with round fruits and long lasting too, 14€. Proof that even in 2013 good wines could be made, clearly a very talented winemaker. L’Enclos Des Roses, Roses 2008, further proof of the benefits of ageing. This showed no sign of being old or tired, it had fresh, dark fruits and is very well balanced. 12€. 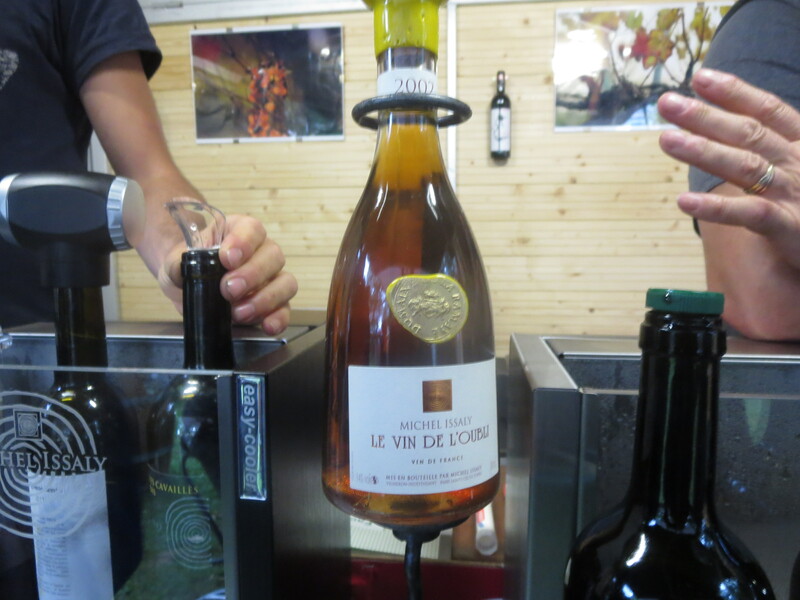 There were some very good sweet wines and one example of a rarity a Vin De Voile. Vin De Voile is a white wine aged in barrels where a layer of yeast is allowed to cover the wines as they evaporate in barrel. 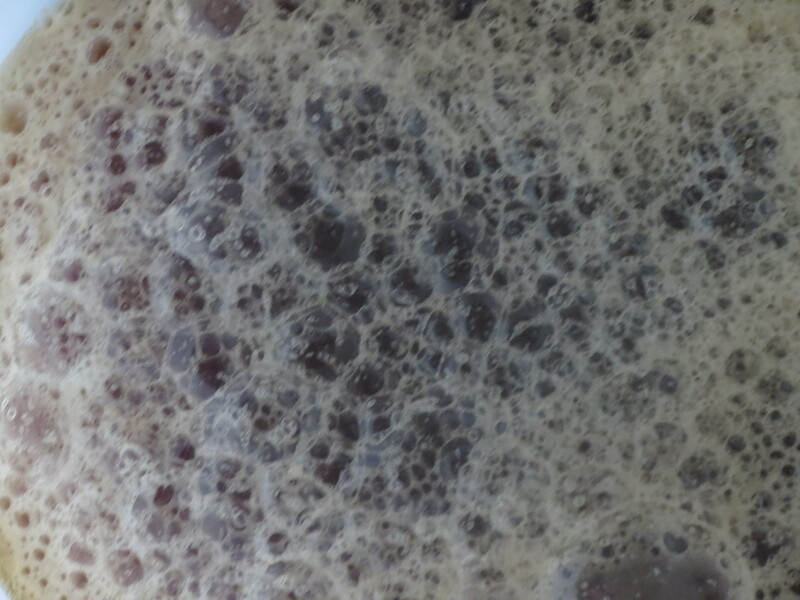 The yeast prevents the wine from being completely oxidised but there is some which adds nutty, sherry like flavours. I really like this style of wine, like the vin jaune of the Jura region. So it was a treat to taste one at Michel Issaly’s Domaine La Ramaye. Almond and hazelnut aromas with dry, nutty flavours and long, complex after tastes. Lovely. My favourite sweet wine was also unusual. Made from very very late picked Cabernet Sauvignon grapes, it was a sweet rosé wine from Domaine de Brin called Brin De Folie 2014. Sweet strawberry flavours and yet clean, refreshing after tastes. A great credit to the winemaker to make something so good from such an unusual circumstance. And there lies Gaillac’s great hope. There are many talented winemakers harnessing the best of the area. 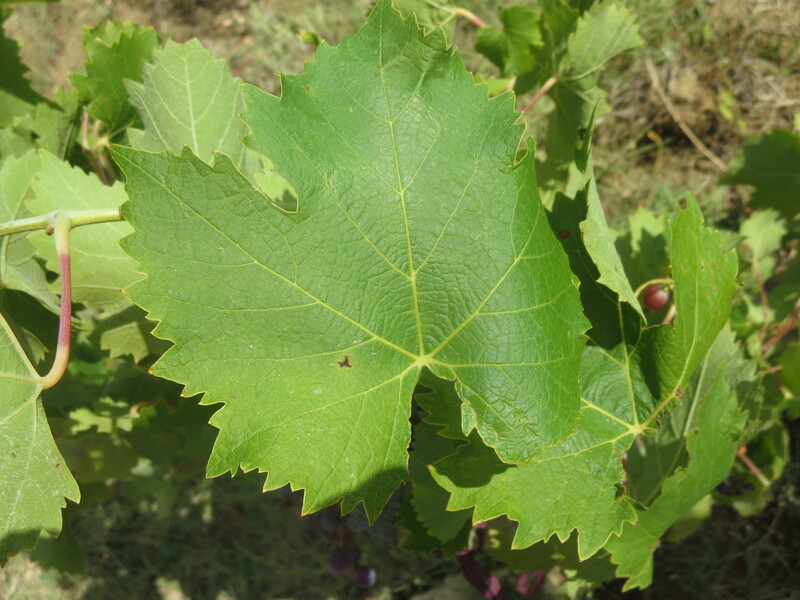 Unusual grape varieties which should offer the market something different. Making the most of those flavours and aromas, letting them speak for themselves rather than too much oak, whilst concentrating on providing well balanced, refreshing wines. That is what I like about producers such as Rotier, de Brin, Ramaye, Rocailleux but many others too. There are some interesting stories about some of these producers too. Rocailleux with its English owners who are following up their interest and studies in wine and making some of the best wines in the area. D’Escausses and Enclos Des Roses owned by two sisters who run their domaines separately but help each other. 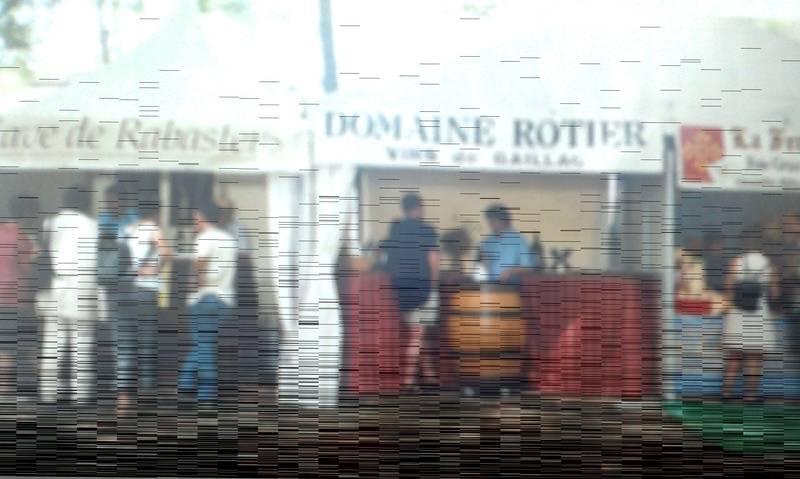 Rotier was my favourite domaine 20 years ago and remains one of the best. De Brin is certainly one to follow. I wish them plenty of good weather for a successful 2015 vintage. 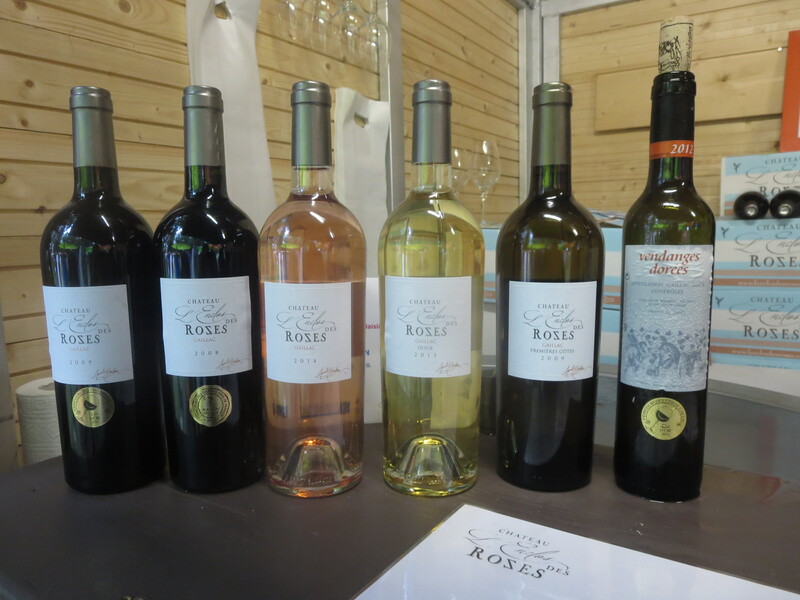 Meanwhile look out for Gaillac wines, especially from these producers. Categories: Tasting, Vignerons, Vines, Wines | Tags: Braucol, Castel De Brames, d'Escausses, De Brin, Duras, Enclos des Roses, Gaillac, Issaly, Labastide De Levis, Lamothe, Len De l'El, Loin D'Oeil, Mauzac, oak barrels, Ondenc, Prunelart, Ramaye, Rocailleux, Rotier, Vin De Voile | Permalink.